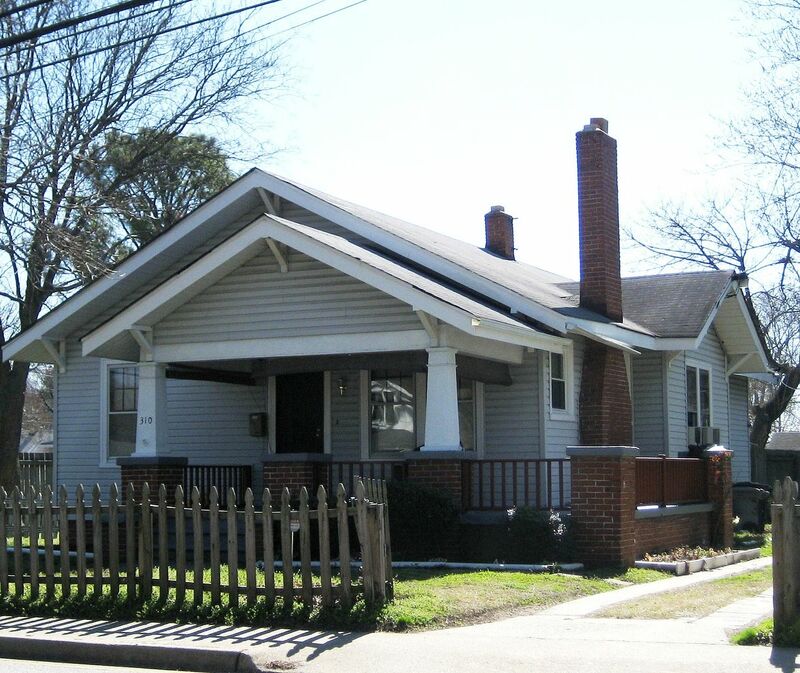 These last few months, I’ve been doing a proper survey of kit homes in Hampton, Virginia. I went out yesterday to check one last section one last time (which I’ve now visited twice), when this handsome bungalow jumped out of the bushes and called my name. This Gordon Van Tine Model #611 is on a main drag (300-block of North Mallory) which leaves me scratching my head. How did I miss it? That will remain one of the great mysteries of the universe, together with, where did I put my husband’s truck keys. 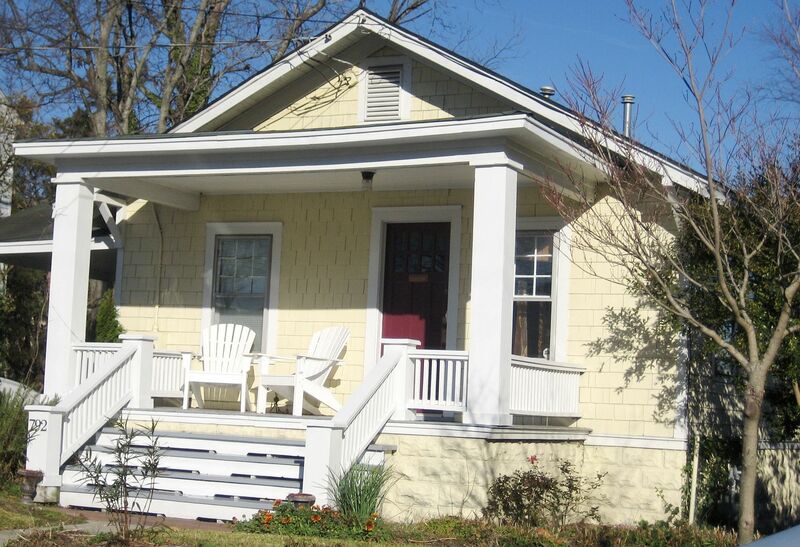 To read more about the kit homes of Hampton, click here. There’s even more about Hampton here. 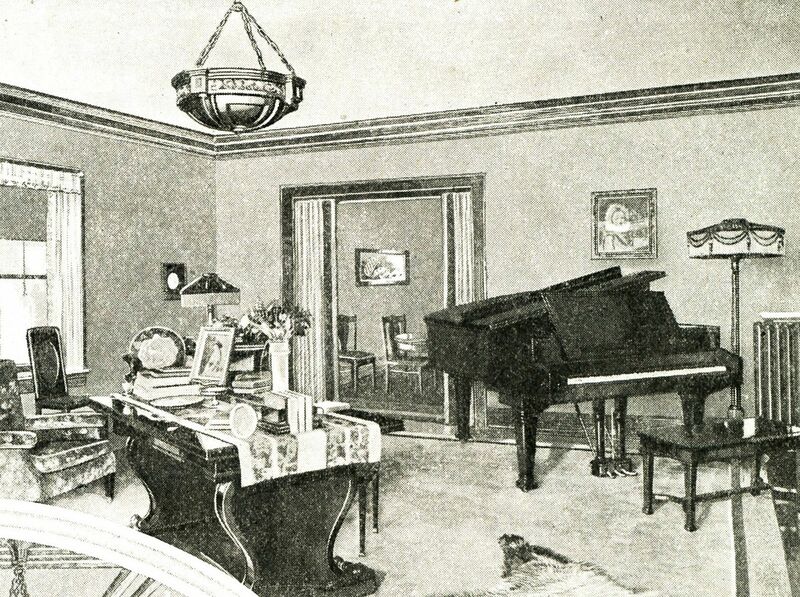 Gordon Van Tine #611, as seen in the 1926 catalog. One of its distinctive features is the oversized porch and deck. 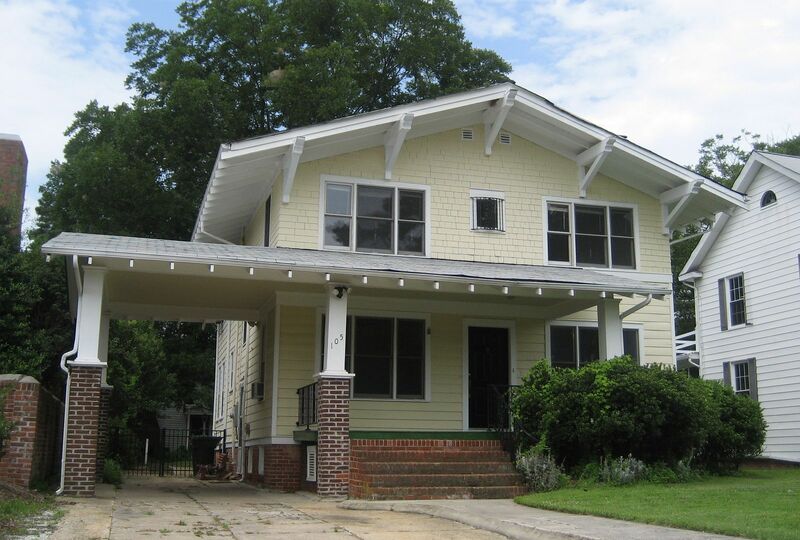 Notice how the porch roof sits within the primary roof. Interesting feature. Sadly, some vinyl siding salesman has pillaged the house, but other than that, it's a nice match. The railings have been replaced, but that's a relatively minor affair. Good match on this side, too! And did I mention it's on the main drag? 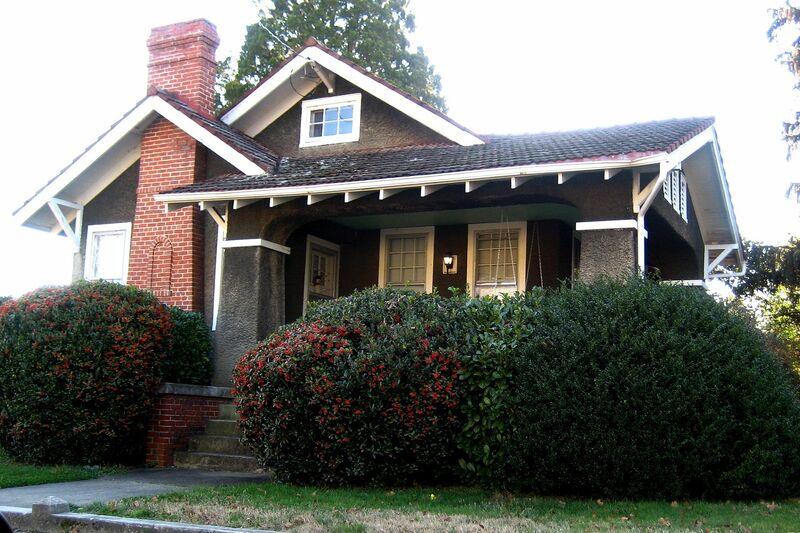 My blog on the Sears Houses in Richmond has gotten several hundred views in the last few days. I am tickled pink to see it, but I wish I knew what led folks to a 15-month old blog! But in the meantime, I’ve made another *fascinating* discovery, which might lead me to a neighborhood of Sears Homes in Richmond! Today, David Spriggs and I were doing research at the Norfolk Public Library, and I found this article (June 16, 1921) in the Richmond Times Dispatch. At first glance, it looks like another 1920s ad, but look closely. 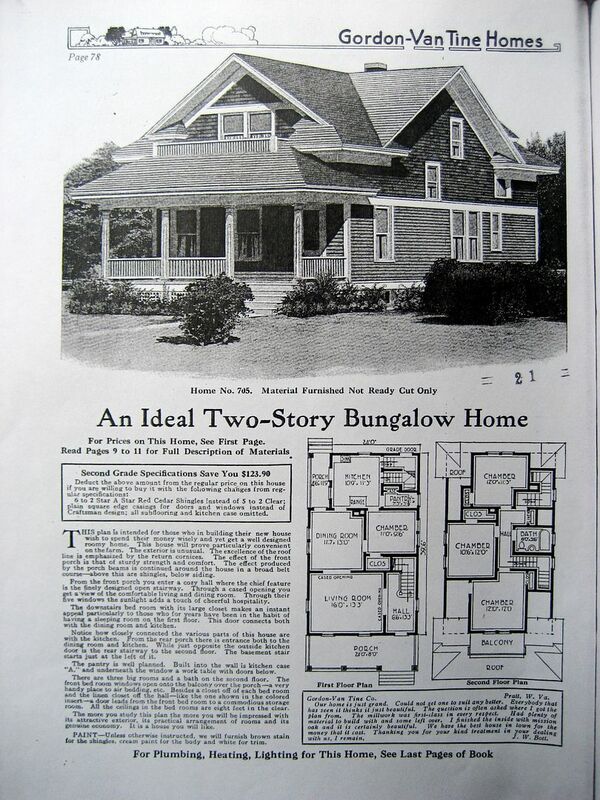 The "beautiful bungalow" shown in the advertisement is a Sears Elsmore. 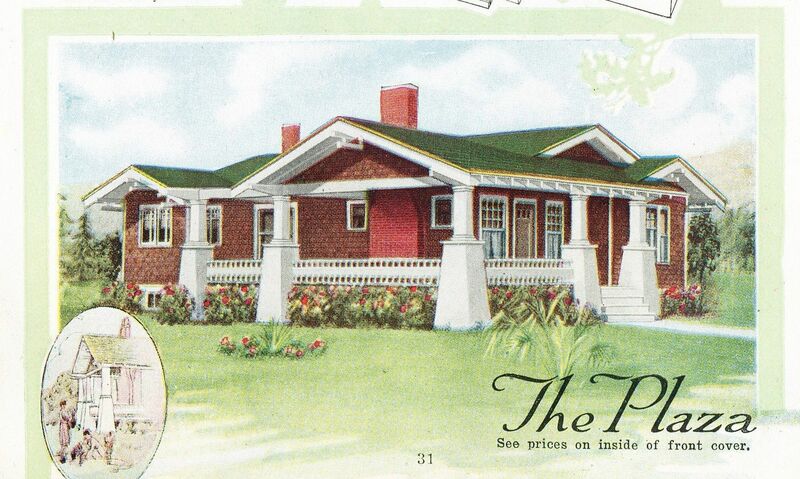 And you can buy “all the material necessary to build this charming bungalow” - from Sears! 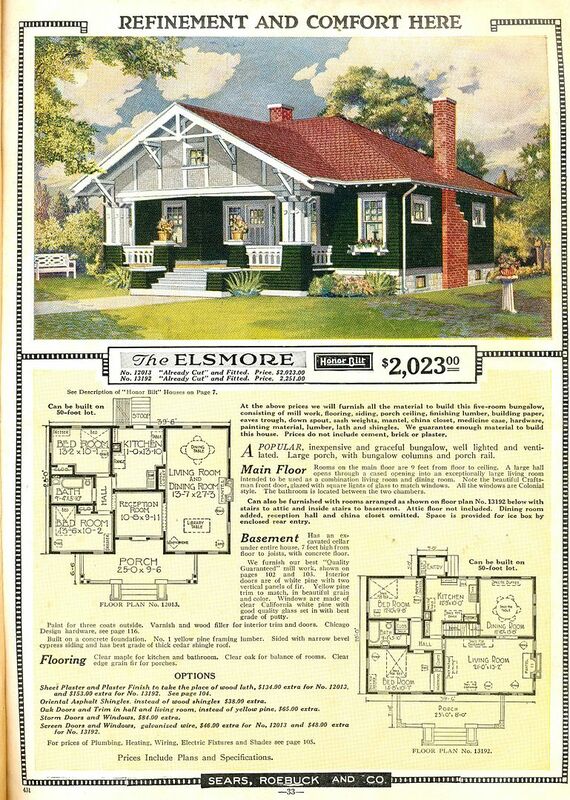 If you look closely at the house in the ad, you'll see it's a Sears "Elsmore." In fact, it's the picture right out of the Sears Modern Homes catalog! This is the picture used in the advertisement shown above. Here's an Elsmore in Elgin, Illinois. 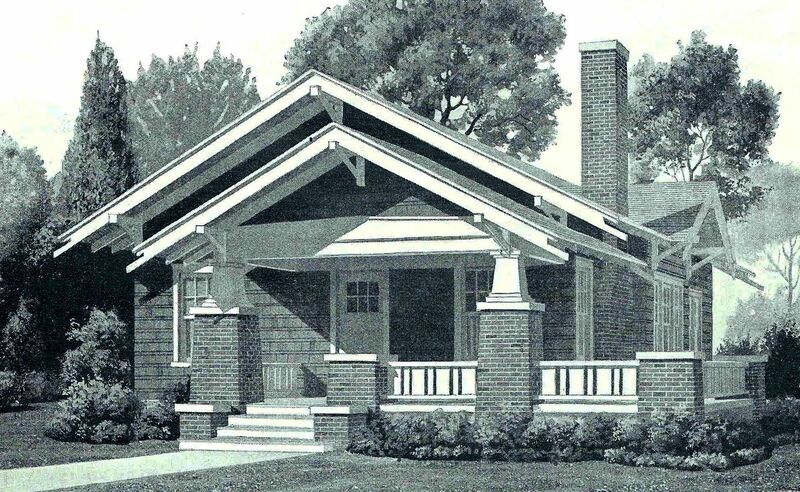 Were any of these "beautiful bungalows" built in Richmond? Perhaps someone familiar with Richmond can help me find this neighborhood! 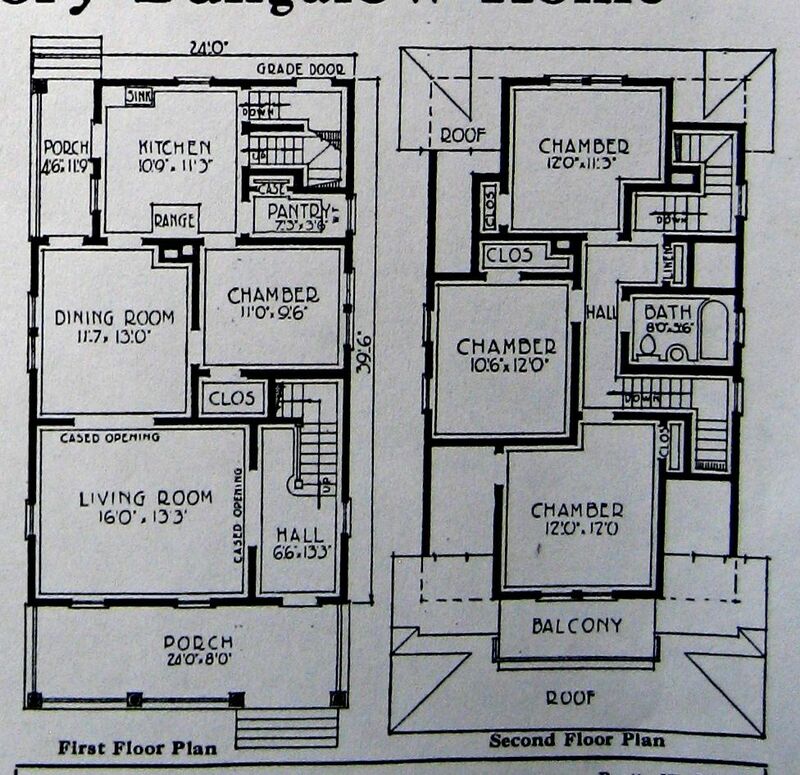 Was the builder successful in pitching these Sears kit homes to the people who bought his lots? This could be fun!! Please leave a comment below if you know where this area is! 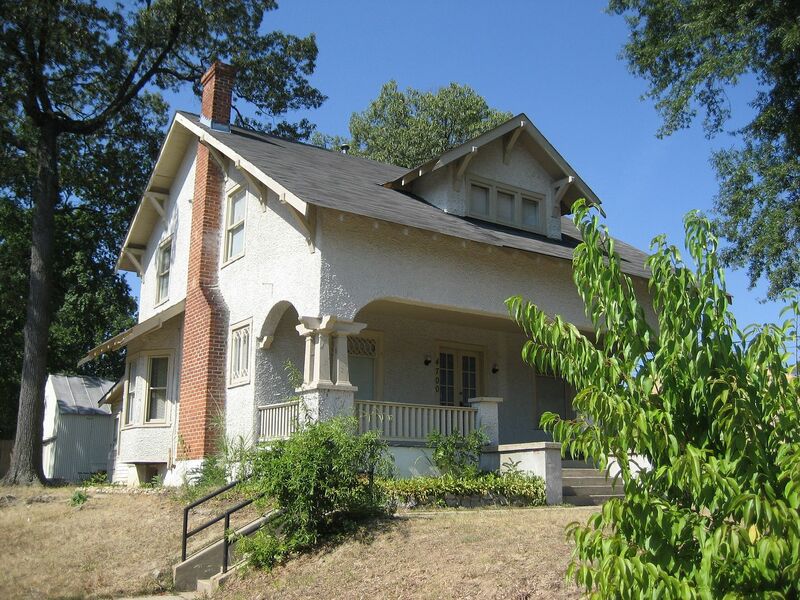 To learn more about the Sears Homes I found in Richmond, click here. The Stanhope, not in Iowa or New Jersey, but Norfolk! Stanhope is the name of a city in Iowa and New Jersey. And it’s also the name of a car that was sold from 1904-1906, by the Twyford Motor Car Company of Brookville, Pennsylvania. But for this blog, we’re going to talk about the Stanhope that was sold by Aladdin of Bay City, Michigan. The Stanhope was a fairly popular house. 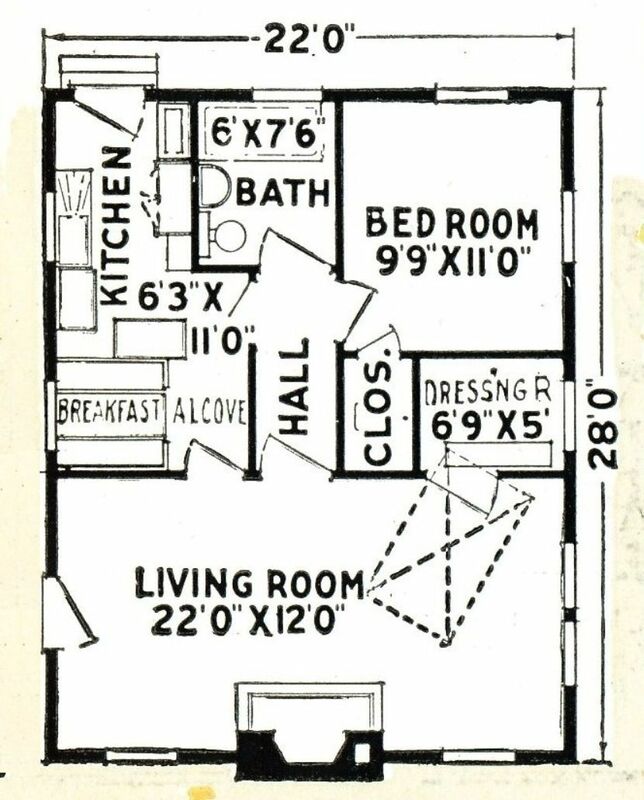 In 1920s America, it was an ideal home in both size and price. 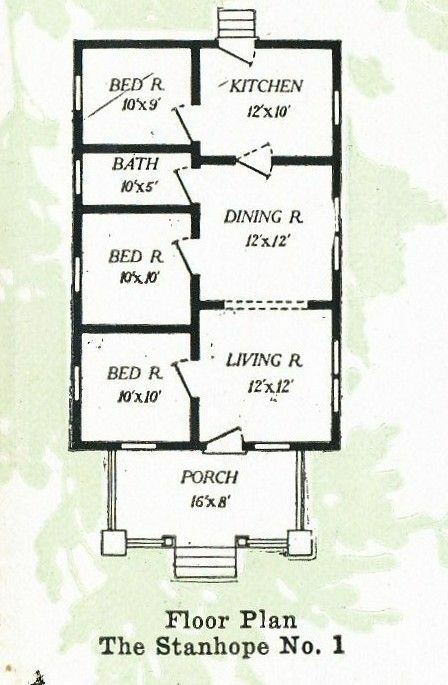 And unlike so many of these diminutive bungalows, it had three bedrooms (most had two). Yes, they were only 10 x 10, but for the family with four girls and three boys, it was probably a whole lot better than fold-out cots in the living and dining rooms (another popular option at the time). 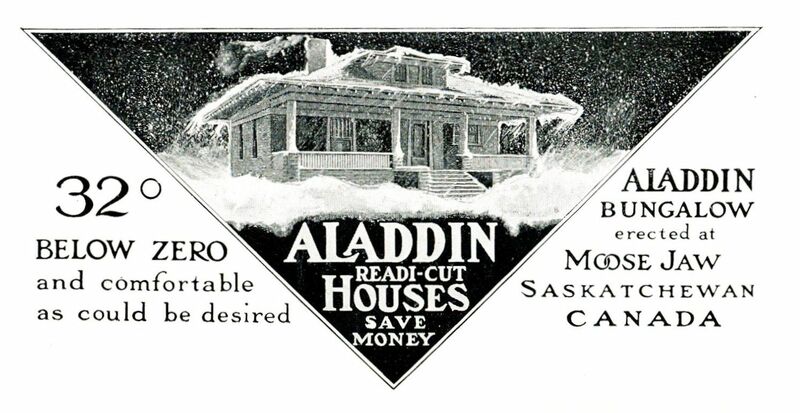 Aladdin, like Sears, offered kit homes through their mail-order catalog. 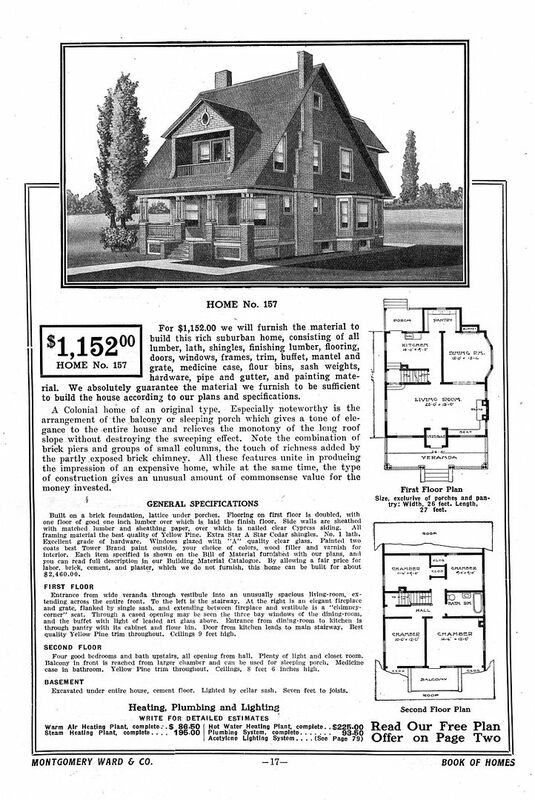 Sears sold about 70,000 kit homes during their 32 years in the building business. Aladdin sold more than 75,000 homes. 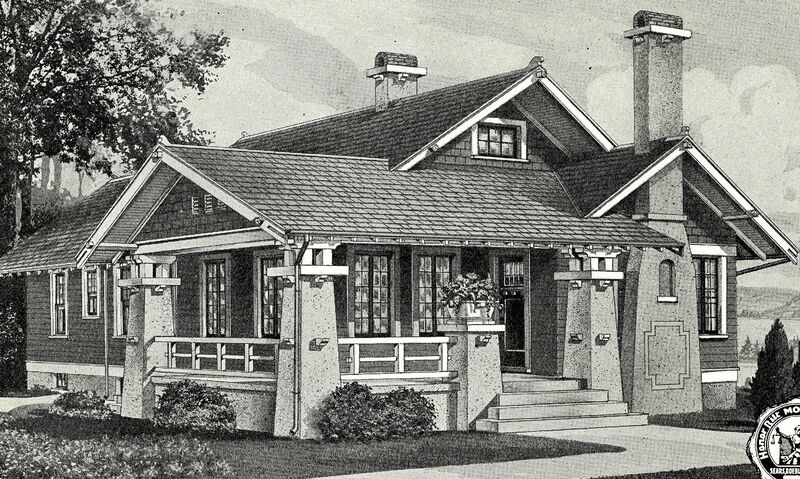 The Sears Modern Homes department was in business from 1908-1940. 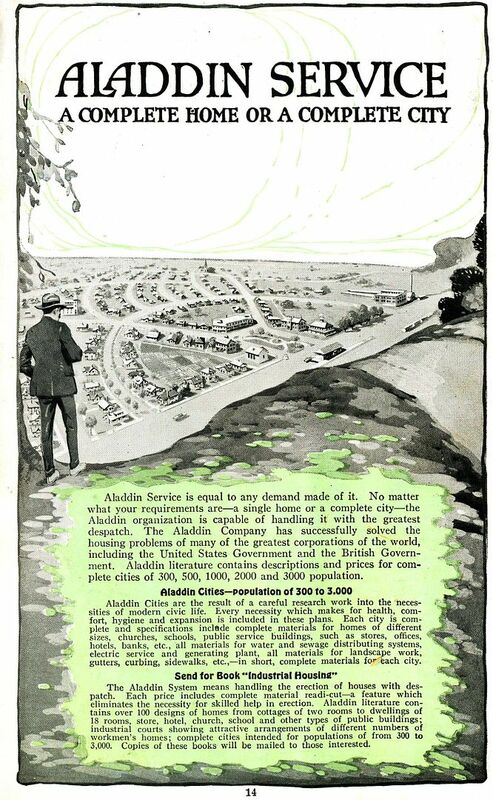 Aladdin started selling houses in 1906, and didn’t close until 1981, a full 75 years! Here in Norfolk, Virginia (where I live), we have many more Aladdins than Sears. Aladdin had a large mill in Wilmington, NC which explains why there are so many Aladdin kit homes in the Southeast. Thanks to Dale Wolicki for providing info on Aladdin! To read more about Roanoake Rapids (which has a massive collection of Aladdin kit homes), click here. 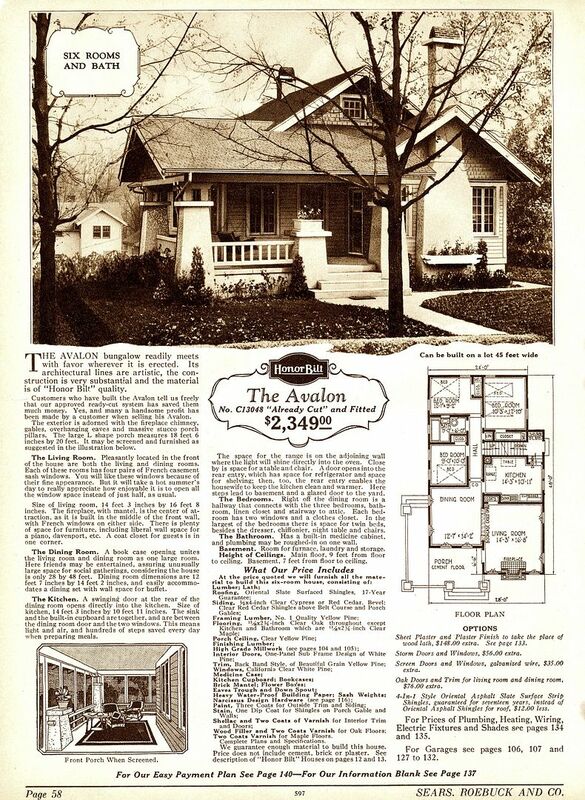 Aladdin (based in Bay City, Michigan) sold kit homes through mail order. This is my favorite graphic from their catalog (1919). The Stanhope was one of Aladdin's most popular little houses. 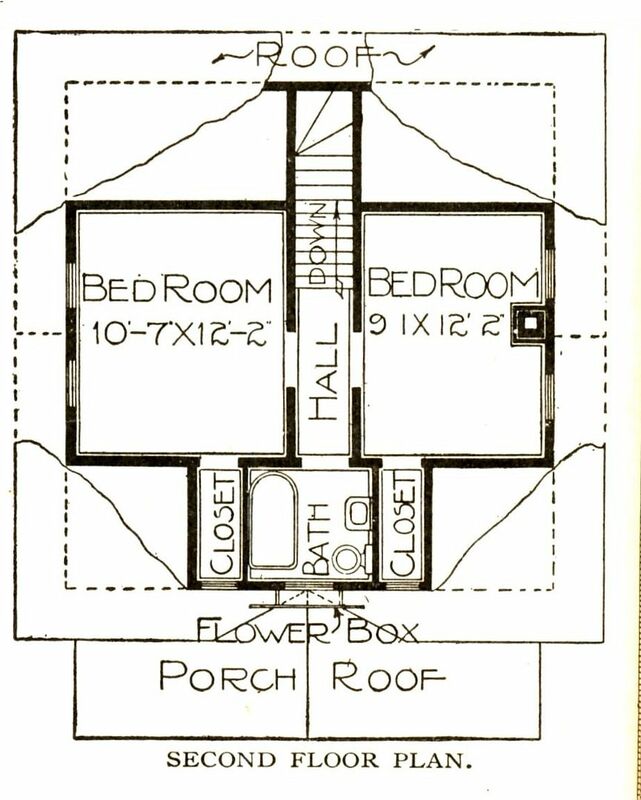 It had three bedrooms, but it was a very small house. 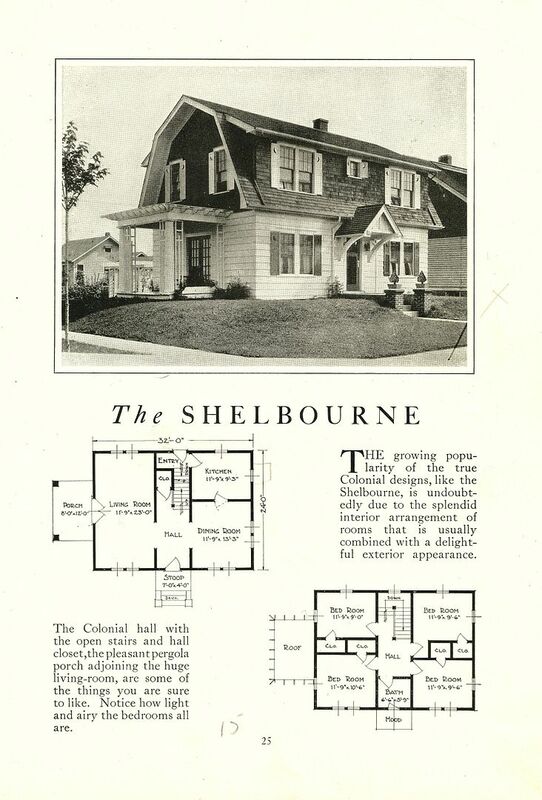 The catalog page featuring the Stanhope, as it appeared in 1919. "Are you not pleased with the Stanhope?" Aladdin was famous for their "Dollar a Knot" guarantee. 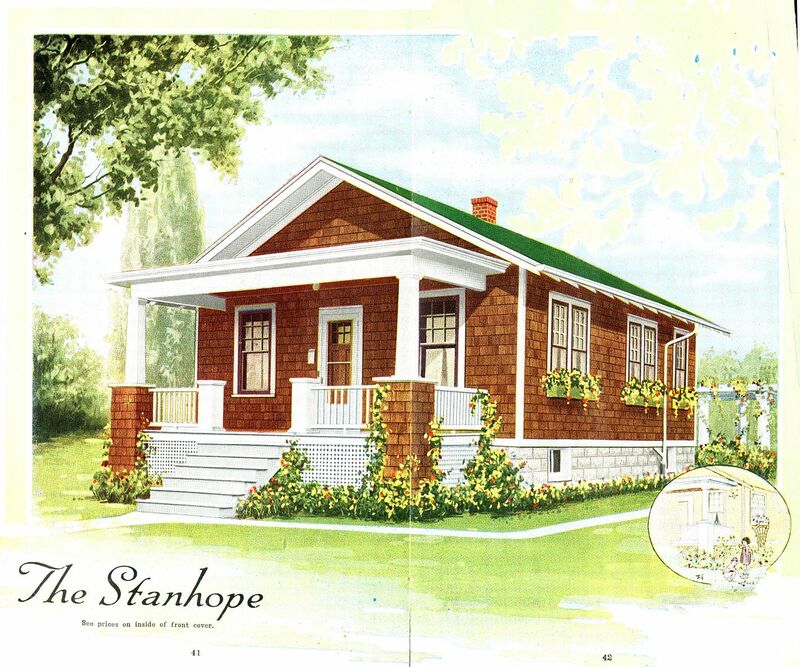 The Stanhope can be tough to identify because it looks like every little early 20th Century bungalow and is rather nondescript. And yet, they can be identified if they're in original condition. 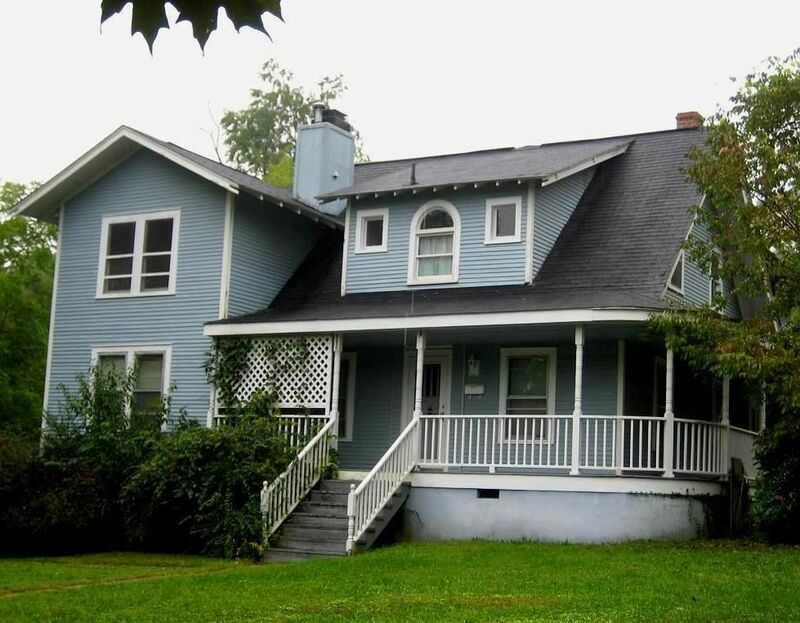 Here's a perfect Stanhope in Scotland Neck, NC (near Roanoke Rapids). And here's one in Norfolk, Virginia. 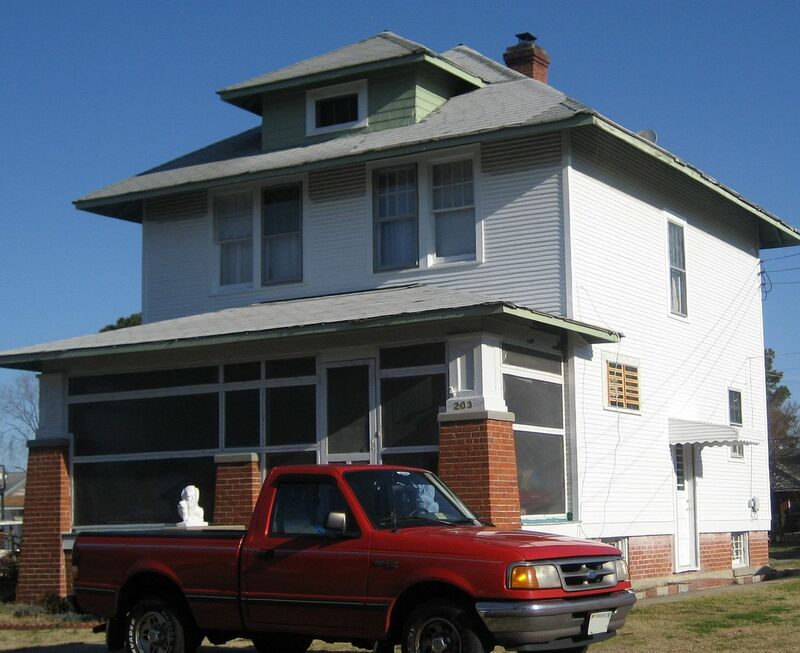 This house is very close to ODU, and is on 51st Street. It's a perfect example of the Aladdin Stanhope and one of my favorite finds! Have you visited Roanoke Rapids? It’s a town FULL of Aladdin kit homes. Click here to learn more. 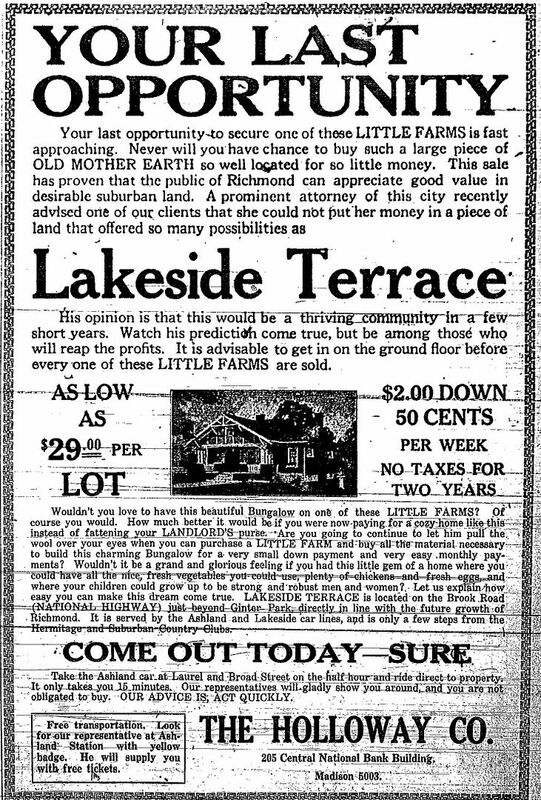 Sears Homes in Richmond! What a Bonanza! In early January 2013, I traveled to Richmond to pick up my daughter at the airport. I had a little extra time on my hands so I decided to drive around in “just one” neighborhood and my oh my, I found several Sears Homes in just a few blocks! I had only a good hour of search time, so hopefully I can return soon and do more looking. 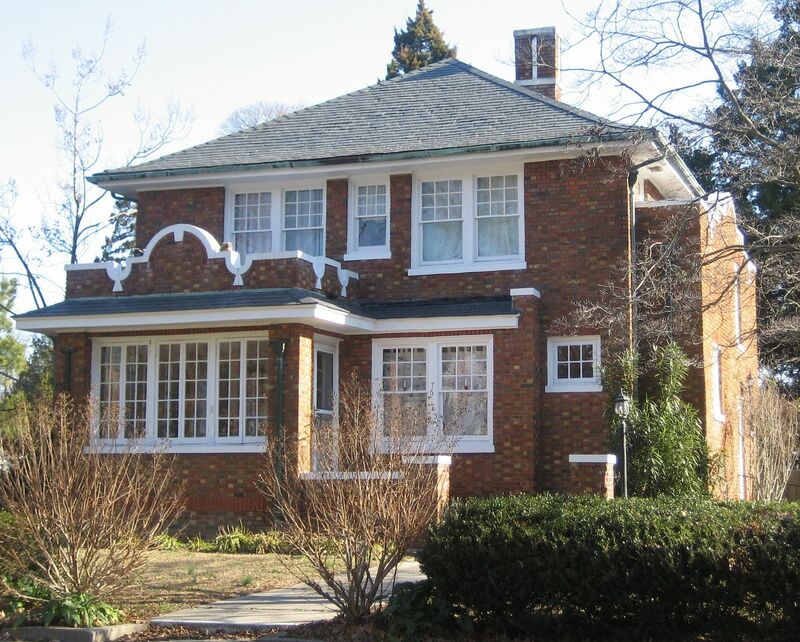 However, Richmond, Virginia is a very large city and it’d be helpful to know where I might find the neighborhoods that were developed in the first years of the 20th Century. And if you’re new to this site, you may be asking, what is a Sears kit home? These were 12,000-piece kits that you could order out of the Sears Roebuck catalog. 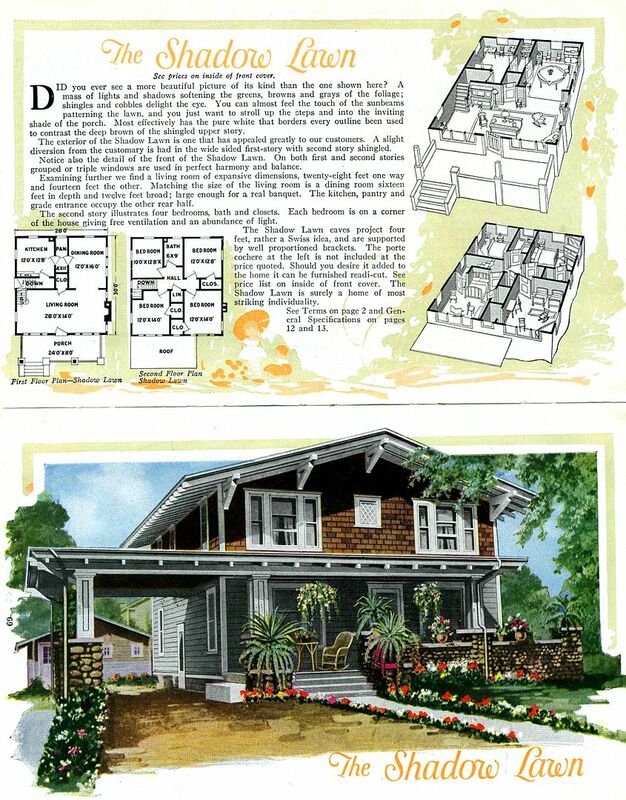 Each “kit” came with a 75-page instruction book and detailed blueprints, specifically designed for the novice home-builder. These were complete kits, and came with all the paint, wood putty, coat hooks, towel racks, lumber, roofing shingles, gutter hardware, and nails that you would need. Plumbing, heating and electrical systems were not included in the kit, but could be ordered separately. During their 32 years in the kit house business (1908-1940), Sears sold 70,000 of these kits in all 48 states. Today, the only way to find them is literally one by one. And if you’re a regular visitor to this site, you may be wondering, how did Richmond, Virginia end up with so many kit homes? That’s what I’d like to know!! And how many more are out there, just longing to be discovered! There’s a new mystery in Richmond! (March 14, 2014) Click here to learn more! And one final note, more than 90% of the folks living IN a Sears House didn’t know what they had until I knocked on their door and told them. So there in Richmond, lots of people are in for lots of pleasant surprises!! 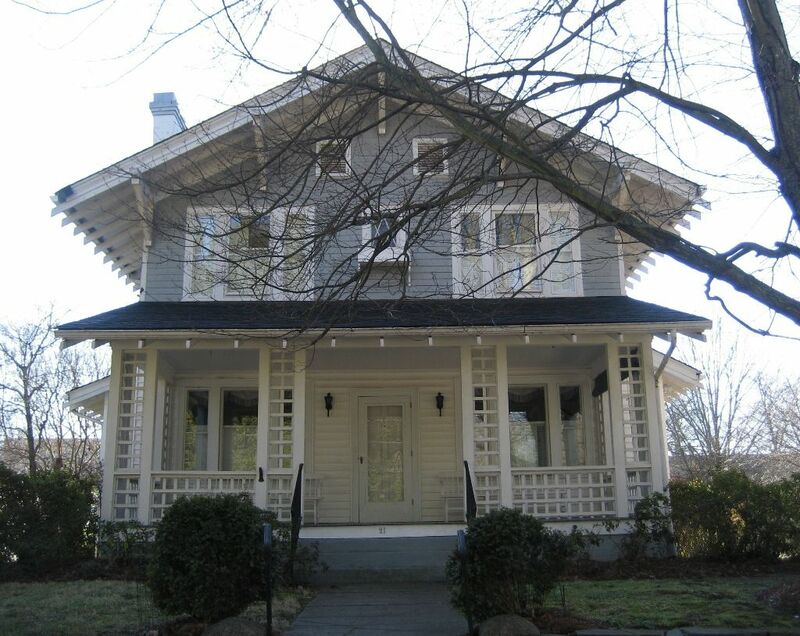 Enjoy the photos below, and if you know of a Sears House in Richmond, send me a note! Should I start with my favorite? 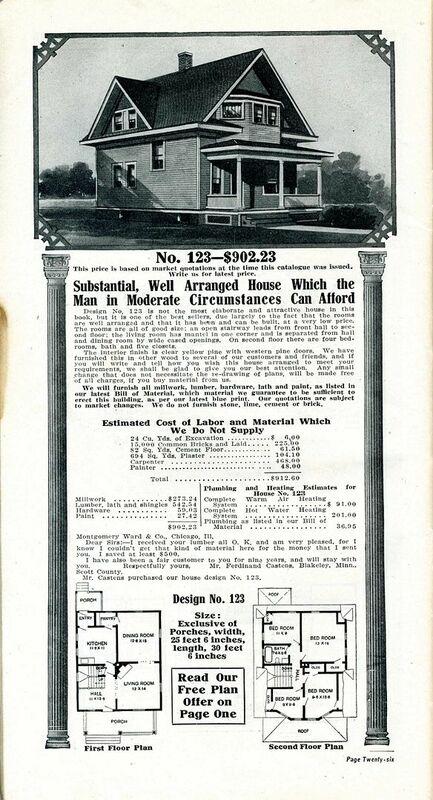 Above is a picture of the Sears Sherburne, from the 1921 Building Materials catalog. It was a spacious, grand house and I've not seen many of these. 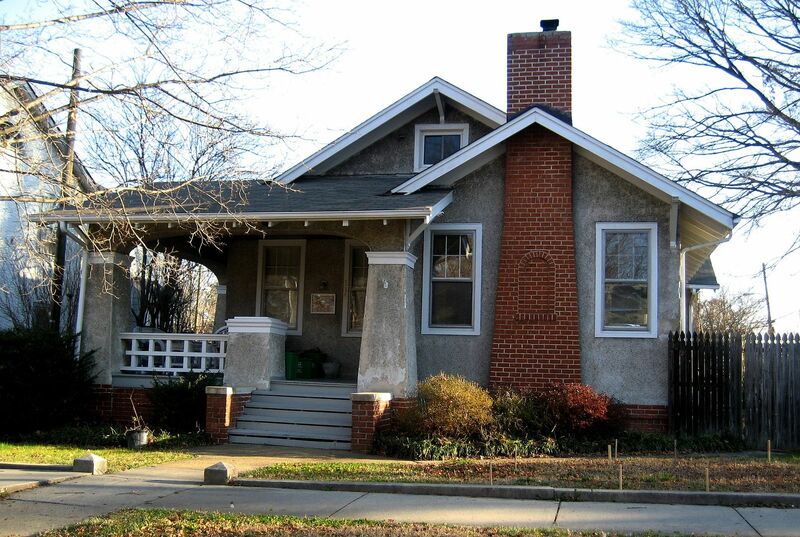 And here it is, looking much like it did when built in the late 1910s or early 1920s. What a house! And it came from a kit! And despite this being a fairly rare model of Sears Kit House, I found a second one, within a few blocks of the first house! And it's also a real beauty! 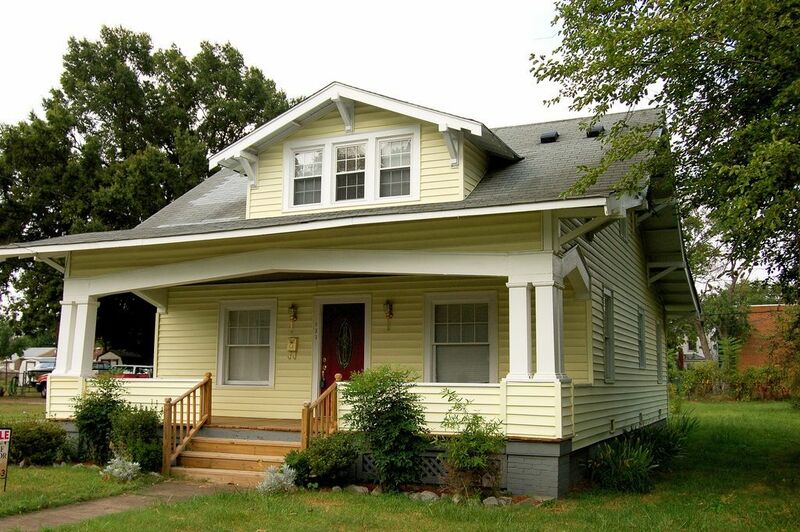 Notice the dramatic cornice returns extending well over the front porch area. The big surprise of this excursion was this house, the Sears Avalon. 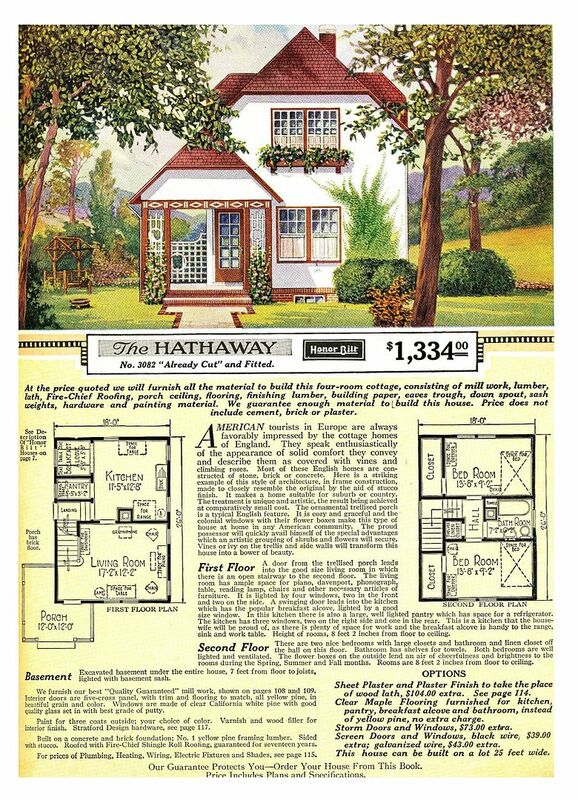 This was another unusually fine and somewhat hard-to-find kit house offered by Sears. Prior to Richmond, I'd only seen maybe five Avalons throughout the country. And yet, in Richmond, I found FIVE within one seven-block area. FIVE Avalons! What in the world?? 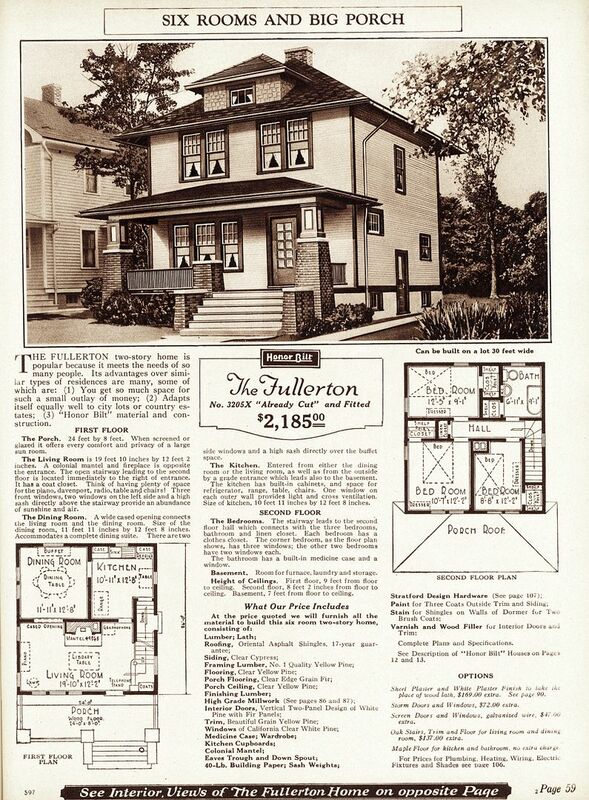 Here's another view of the Avalon from the 1921 catalog. 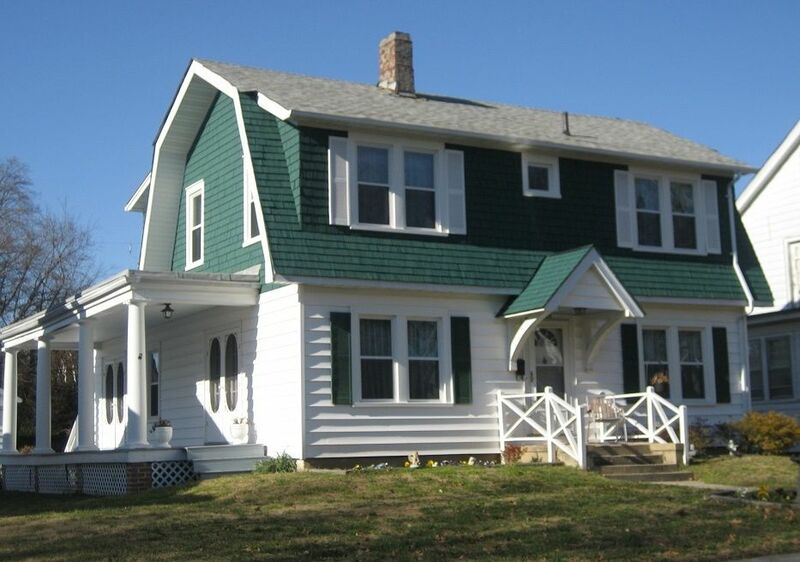 Notice the three square vents on the gabled porch roof (far left) and the small indent in the chimney. 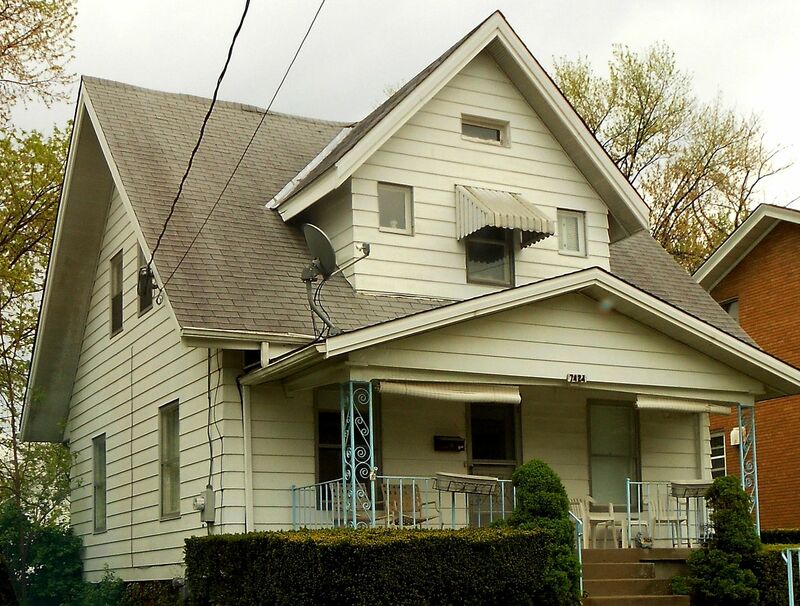 Also notice the small attic window over the porch. 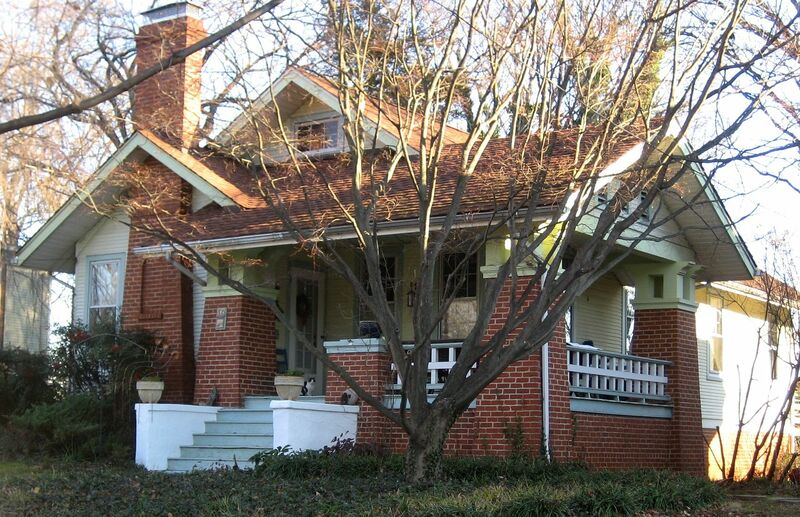 See how the porch columns are mostly masonry with a little bit of wooden column? These are all distinctive features. 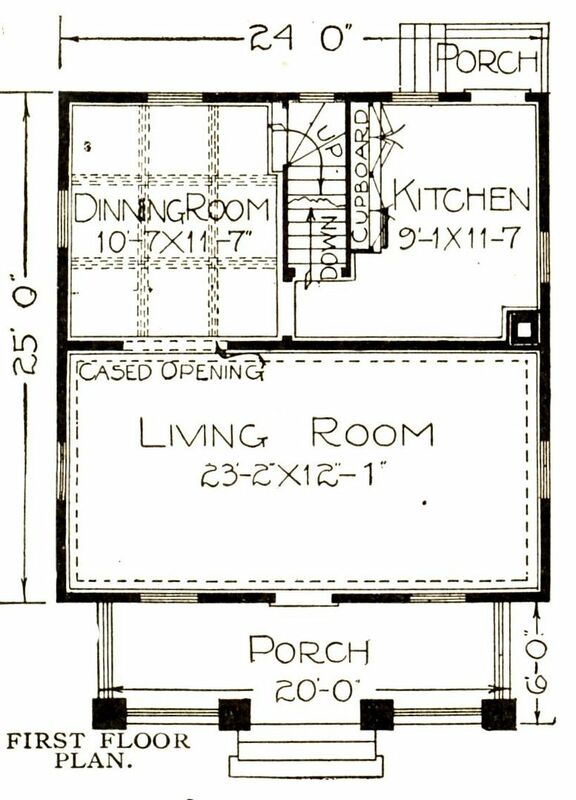 And the floor plans could be "reversed," to take advantage of better lighting on the site. Wow. Just wow. One of the most perfect Sears Avalons, right here in Richmond. Wow. Wow, isn’t that exciting to see such a perfect match to an old Sears catalog page? And whomever owns this house, really loves it. Wow! 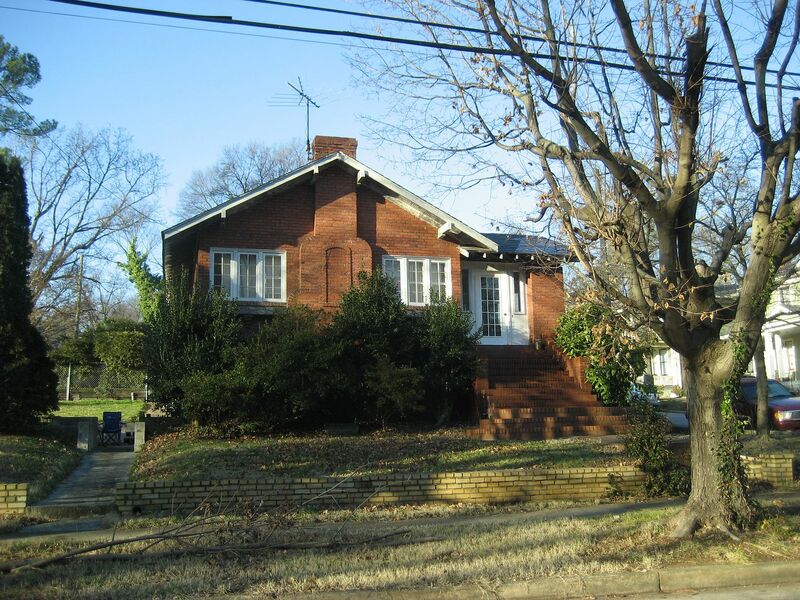 Avalon #2 was on Semmes Avenue, near 30th Street. 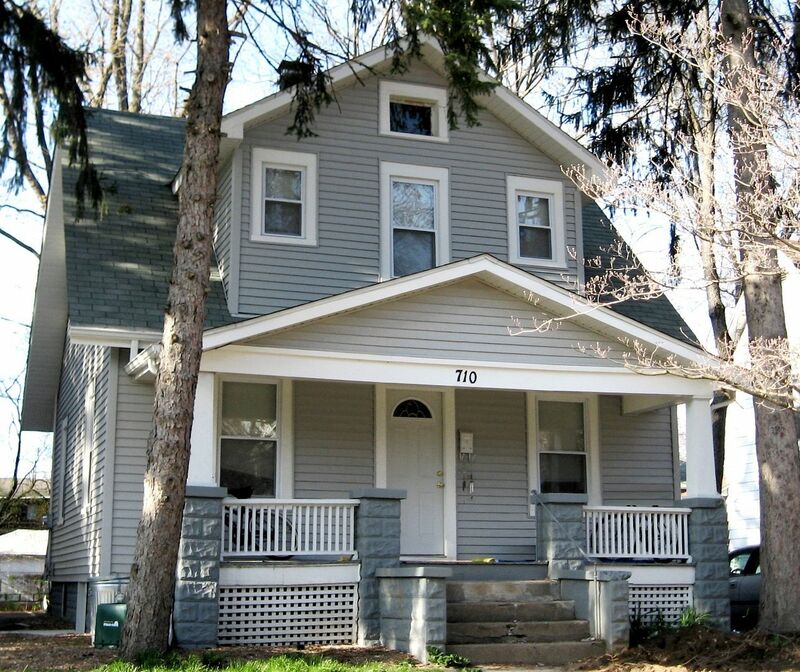 This house also has those three vents on the gabled end of the porch. 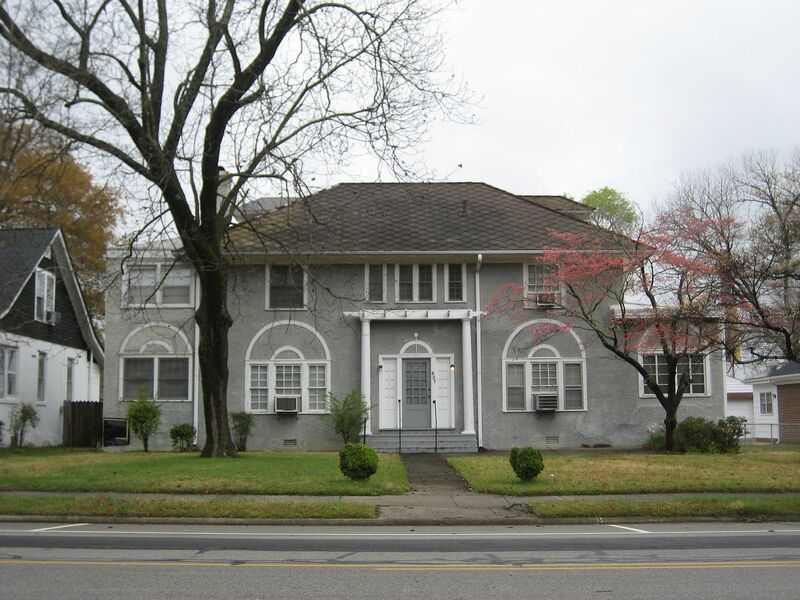 In that this house has stucco, the porch columns were a little different, but that's a minor alteration and not significant in identifying this as an Avalon. Avalon #3. I'm very happy that Richmond has so many Avalons that they're to be numbered for identification. This was also retains its original railings. How cool! Pretty amazing, isn't it! Avalon #4. Turns out, most of these Avalons face due West, so I was photographing right into the morning sun. Some of these pictures aren't the best, but one has to do what one has to do! 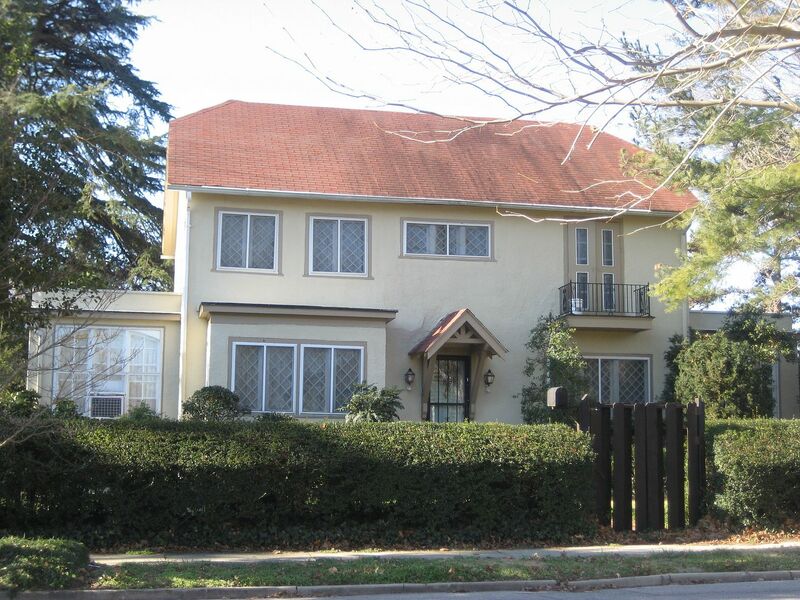 This house was on Riverside Drive. That's my hand at the upper left, trying to behave like a sun shield. Avalon #5. Despite its modifications and alterations, I'm fairly confident that this is a Sears Avalon. The roof has been raised, giving it a higher pitch, and creating a small indented space in front of that attic window, but if you look at the details, you can see this looks like a Sears Avalon. Unfortunately due to sidewalk construction, I was not able to get a better photo. So that’s FIVE Avalons in this one small section of Richmond. FIVE. Prior to this, I’d only seen five Avalons in all my travels. Now I’ve seen 10. But there's still more. 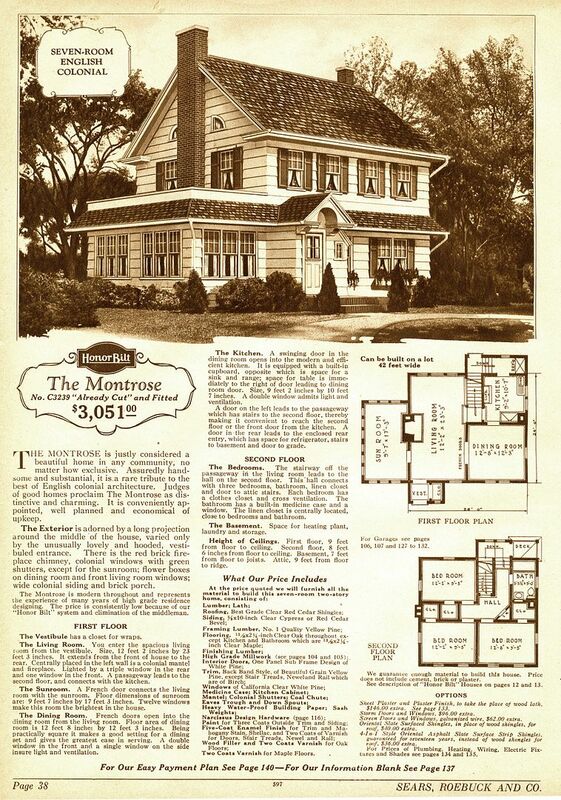 This is a Sears Montrose as seen in the 1928 catalog. 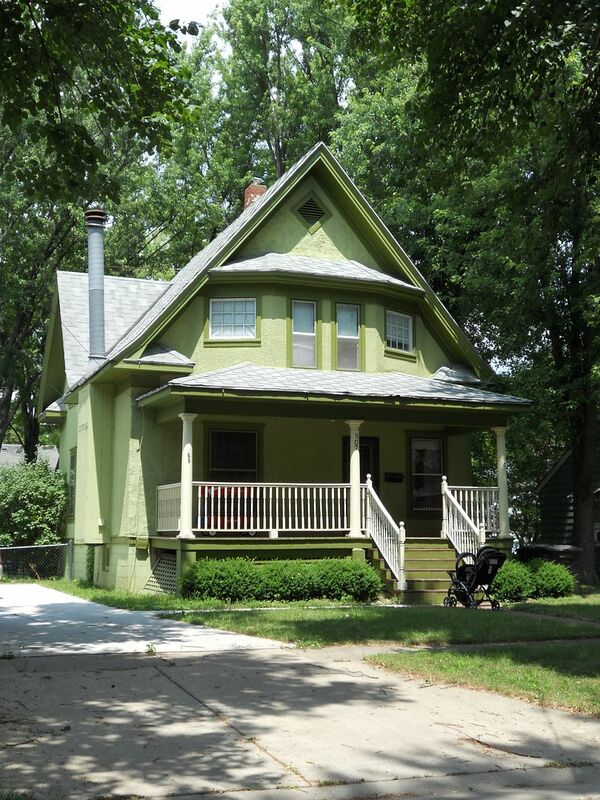 Several unusual features around the front door give this house its distinctive appearance. Is this a Sears Montrose on Roanoke Avenue? It's pretty close. Look at the pent roof that continues around that sunporch. And look at the details around the front porch. 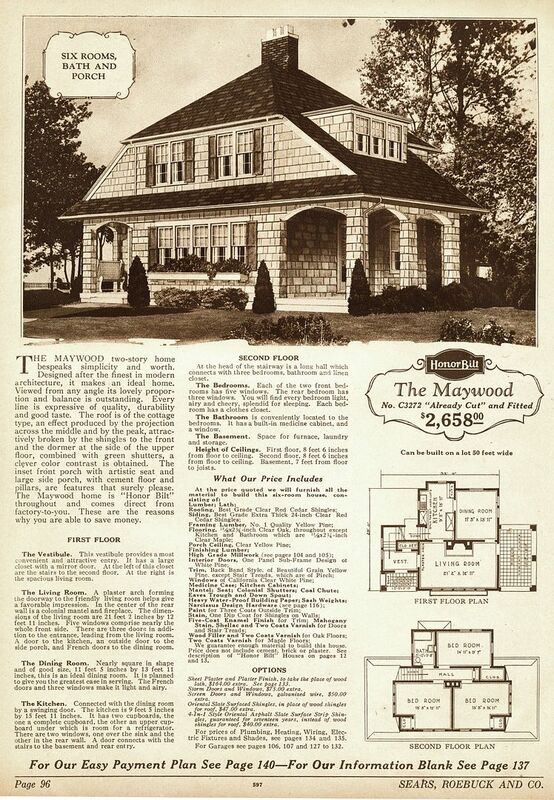 The Sears Maywood was one of their finer homes. This appears to be a Sears Maywood, tucked away behind the trees. 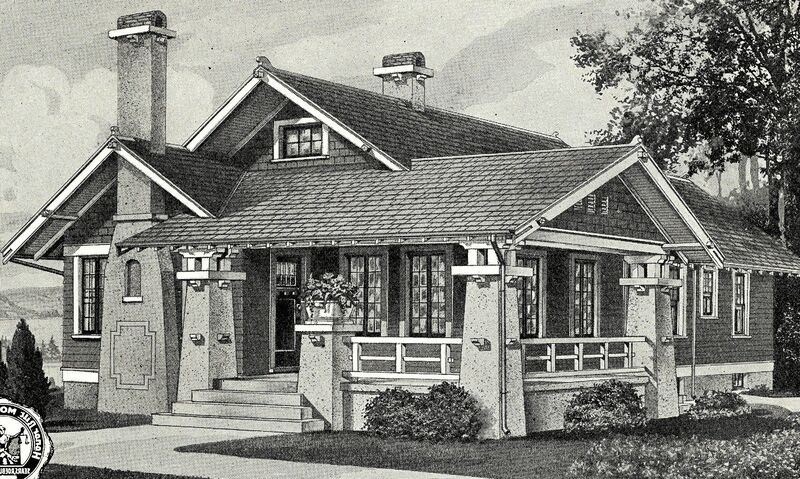 The Sears Westly was a very popular house for Sears. And you've got a lovely Westly in Richmond! 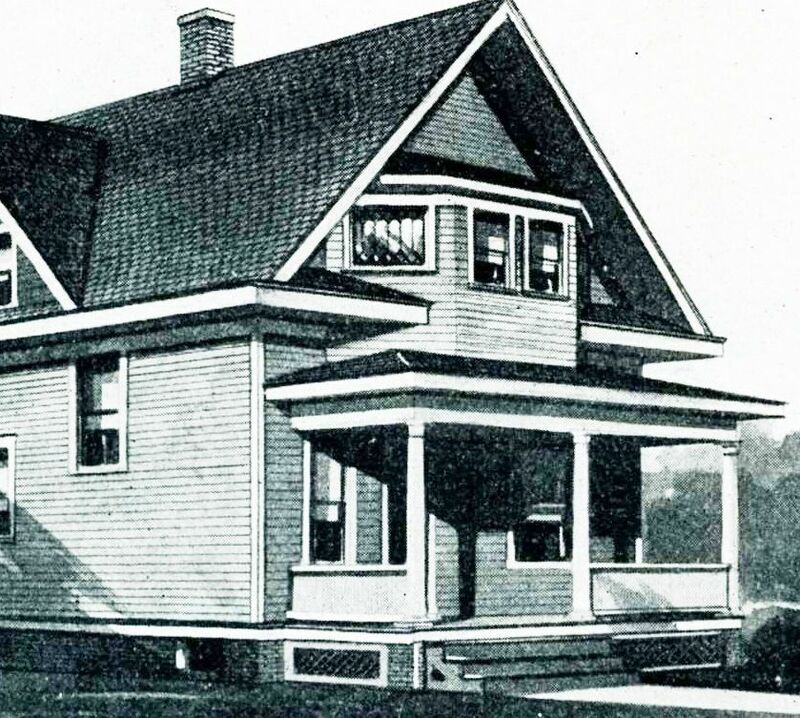 This was an interesting find: An older Sears House (pre-1916). This was model #190. And such a nice example! The Sears Strathmore has always been one of my favorites! And here's another perfect example of it! 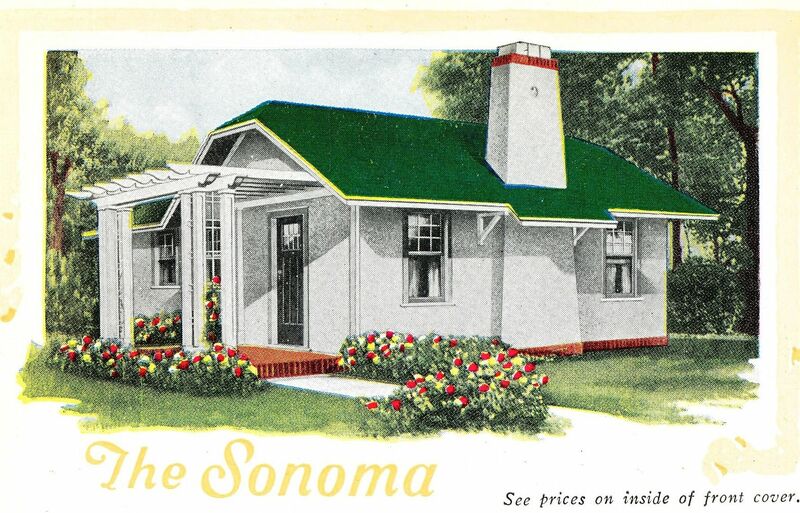 In addition to Sears, there were six other companies selling kit homes on a national level. One of them was Harris Brothers. They were based in Chicago and a much smaller company than Sears, so imagine my surprise at finding a HB house in Richmond! This is Harris Brothers Model J-161 (1920 catalog). 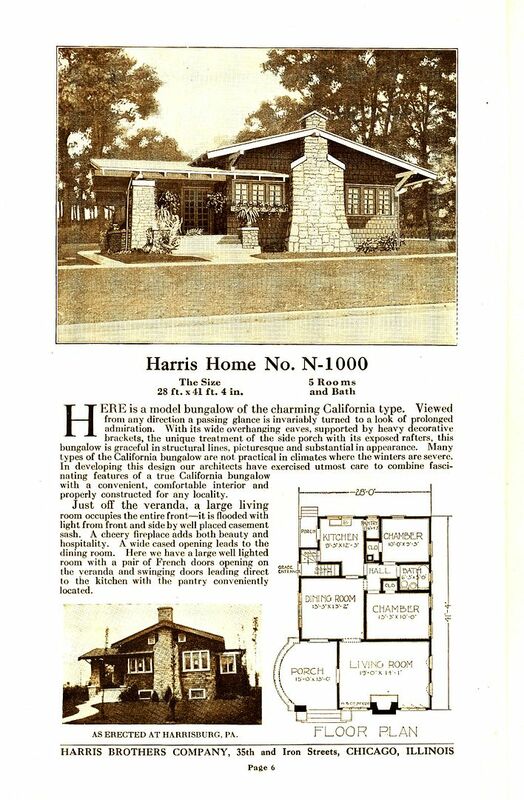 One of the more popular houses offered by Harris Brothers was this house, Model N-1000. Is this the N-1000 (shown above)? It's certainly a possibility. 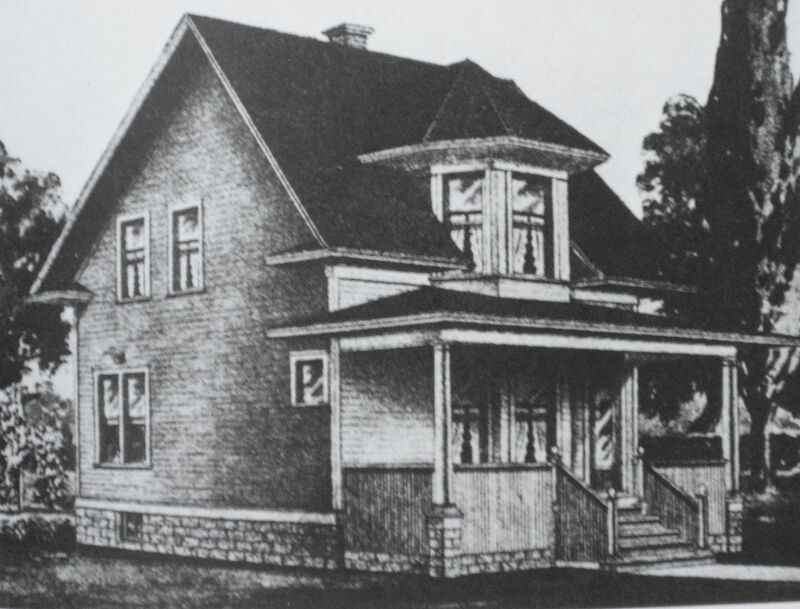 Although not visible in this photo, this house has the rounded front porch, as seen on the floorplan in the catalog image above. Another national kit home company was Gordon Van Tine. They were probably almost as big as Sears. 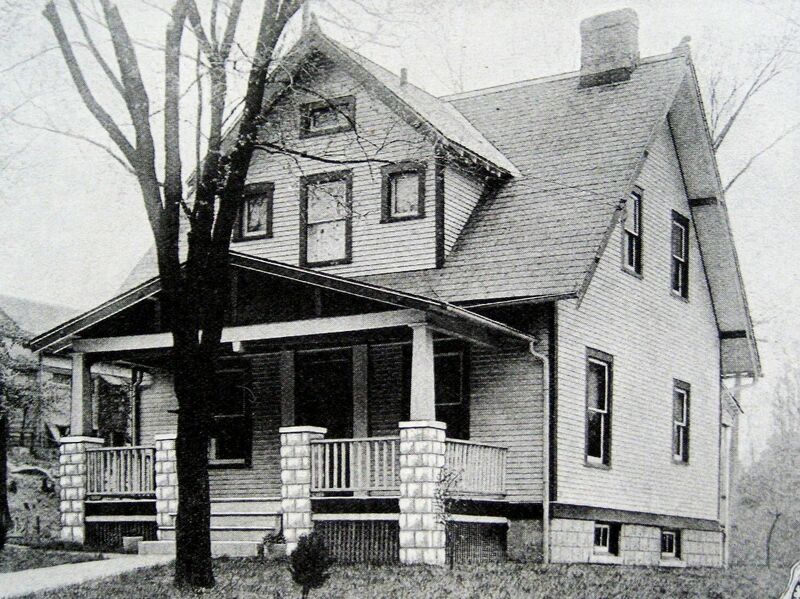 Here's a picture of the Gordon Van Tine Home #507. And here's a perfect representation of #507. Gosh, what a fine-looking house. Photo is copyright 2010, Taber Andrew Bain and may not be used or reproduced. How many more kit homes are hiding in Richmond? Probably a bunch. These houses above represent a brief visit to Richmond. 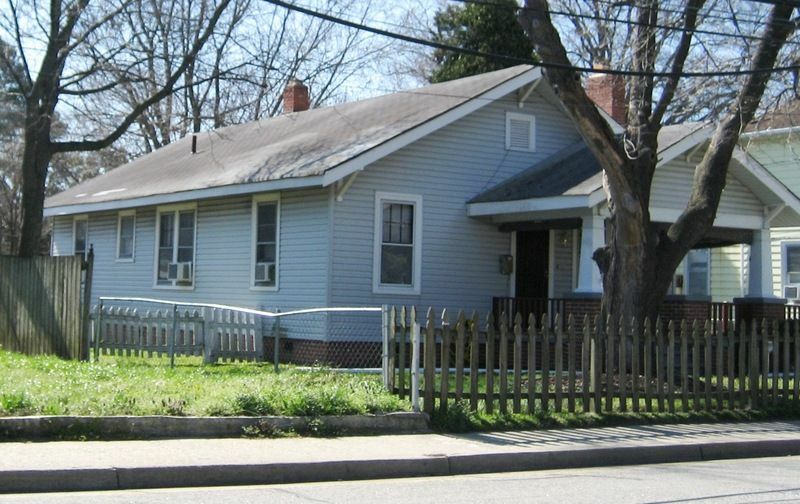 I’d love to return to Richmond and do a more thorough job of finding these houses, but where to look? The Sears Marina: Just Add Water! 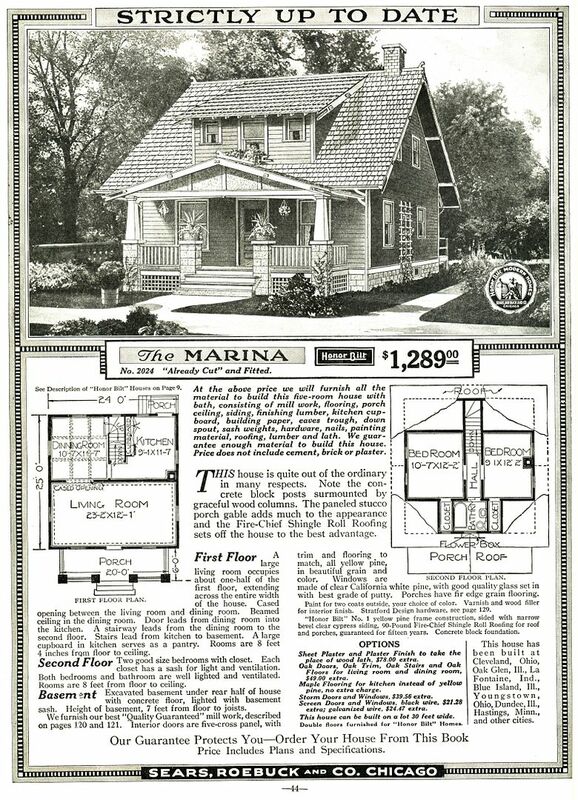 “Marina” comes from the Latin word marinus, which means “of the sea.” It’s hard for me to get a sense of any nautical theme in this Sears house. The kit did not include a free wooden oar or a cute little life vest. It’s still a darling little house. Sears Marina, as shown in the 1920 catalog. 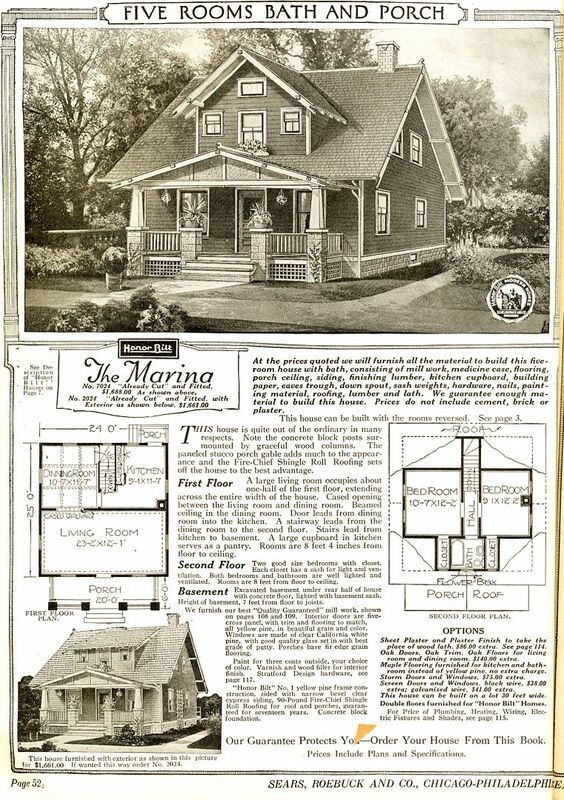 There was also a "Marina" with a shed dormer (1919 catalog). 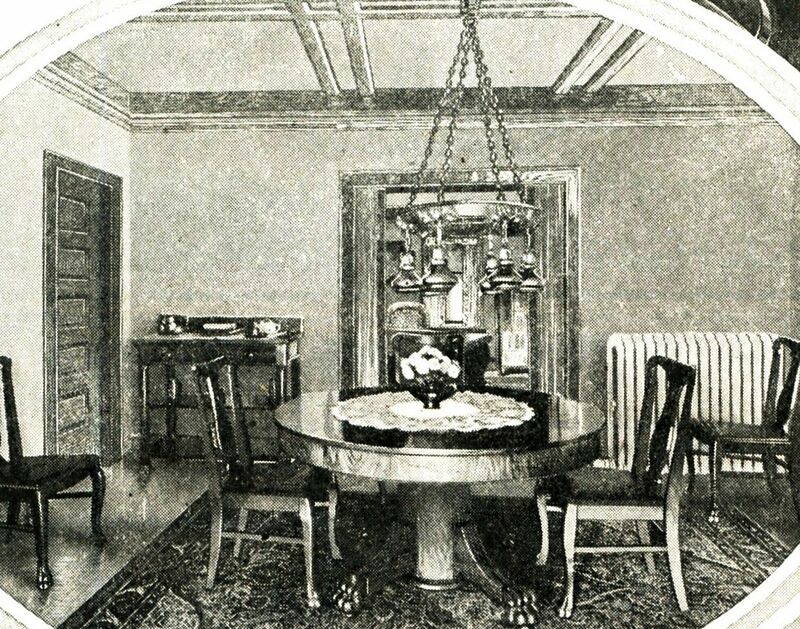 Despite its being such a modest little house, it had a beamed ceiling in the dining room, and crown moldings in the spacious living room. 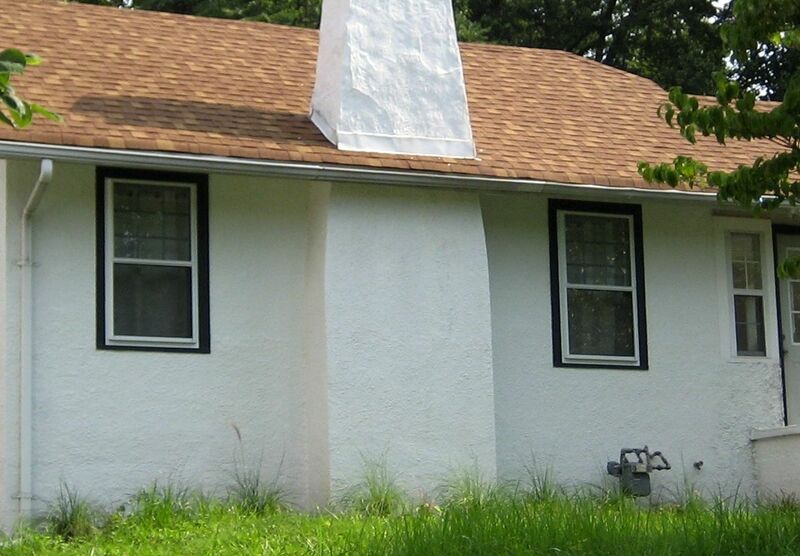 That large dormer on the front housed the tiny bathroom. Also upstairs were two very "cozy" bedrooms. A narrow dormer on the back provided the headroom for the staircase. The photos shown here give a false impression of spaciousness. I doubt that many Marina owners had a baby grand in the living room. That chandelier is hanging a bit low! Looks more like a high-intensity heat lamp to keep the food warm. Notice the beamed ceiling. Also noticed the radiator in the background. Sears offered the Hercules Steam Heating Outfit as an extra for any kit home, but it was THE most expensive heating system available. Steam Heat is a very comfortable heat, but it's pricey to install (and today, it's pricey to maintain). Did the Marina really have subway-tiled wainscoting - as is shown here? I seriously doubt it. That was a feature typically found in upscale homes. Notice the wood floors, too. 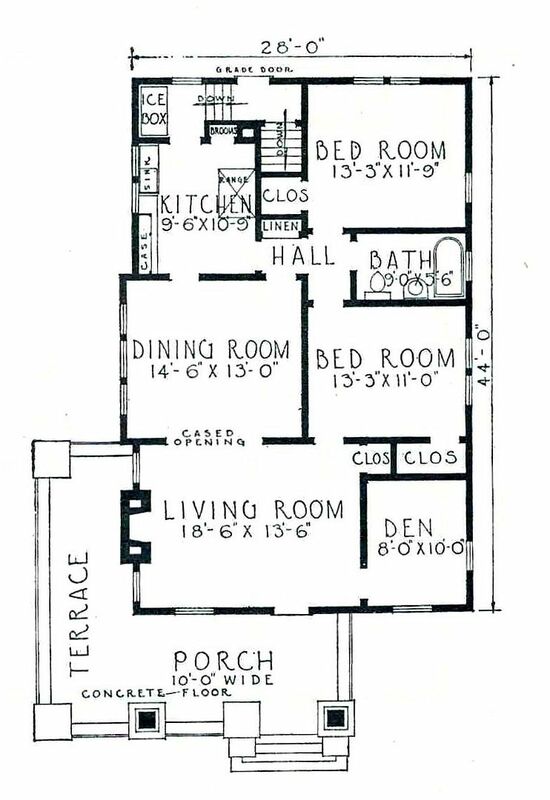 Most Sears Homes had tongue-and-groove maple floors in the kitchens. 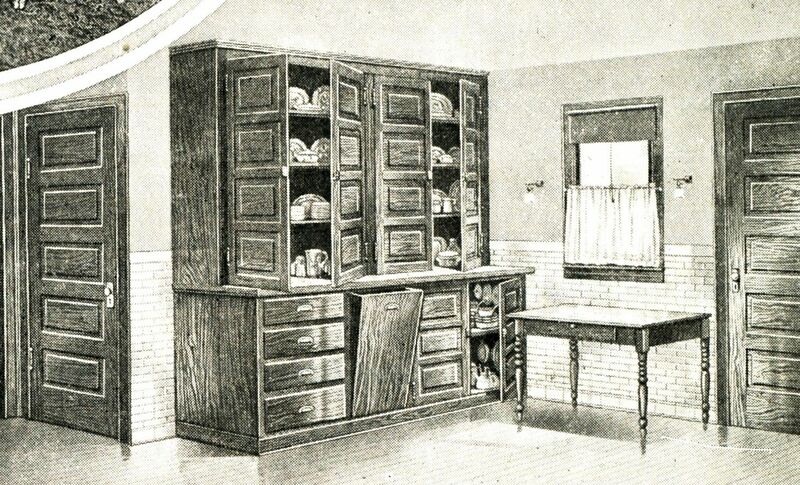 Aside from all that, this kitchen was a scant 9' by 11'. Pretty small. An old photo of a Sears Marina in an unnamed city (1923 catalog). My favorite Marina! This pink Marina is in Alton, Illinois. It still retains its original siding, which is remarkable. The porch on the rear has been enclosed. Four little Marinas in a row in Atlantic City, NJ. 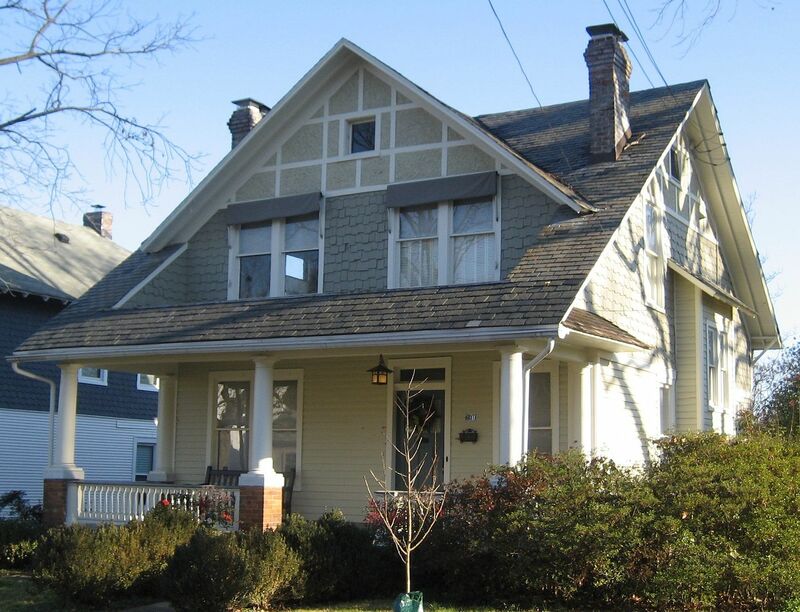 Three have the gabled dormer and one has the shed dormer. I'd love to get a contemporary photo of these houses! 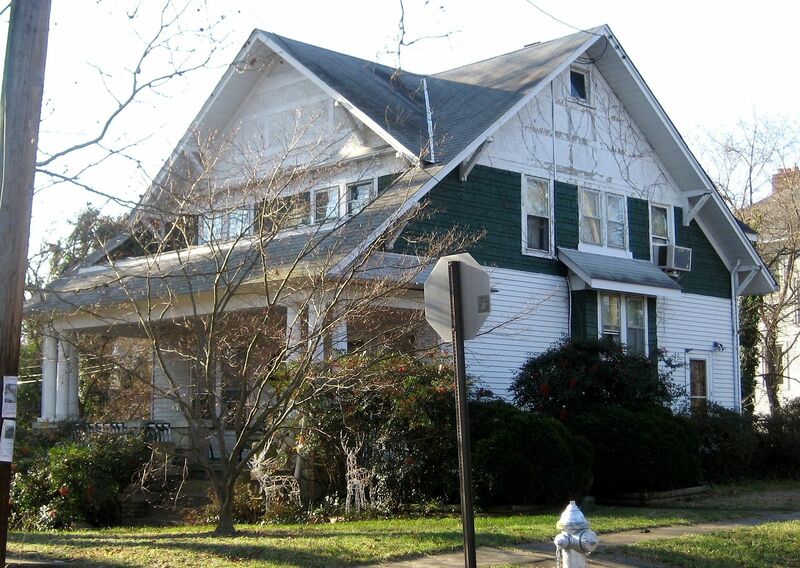 Thanks to Mark Hardin for finding their specific address: Pennrose Avenue! This Marina is a fine match to the original catalog image. It's in West Chicago. Two Marinas sitting side by side in Wardensville, WV. Wardensville is a tiny town just outside of Moorefield, WV. And by the way, did you know that Rebecca has a new book out? Read about it - here! Although substantially remodeled (and added onto), there's no mistaking that this is a Sears Marina. 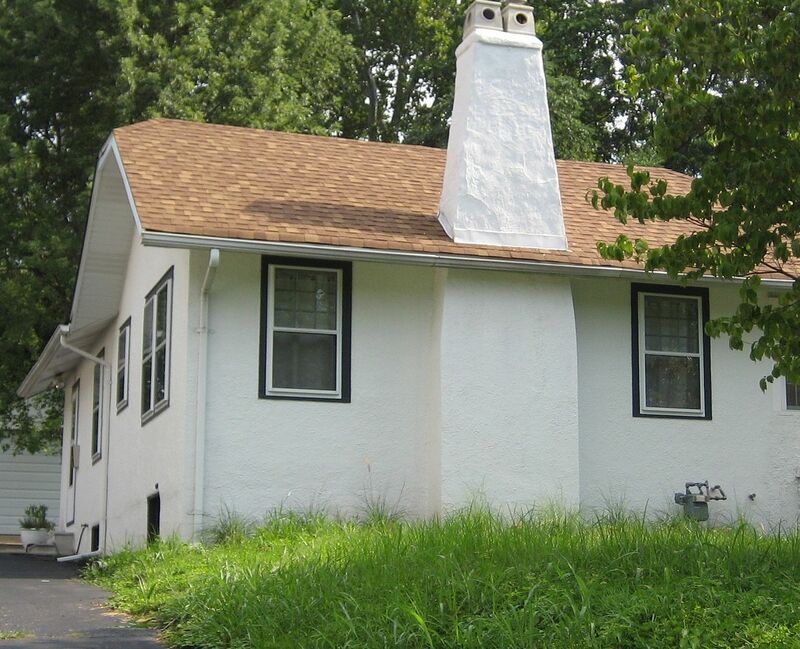 This little house is in West Virginia (near Lewisburg). 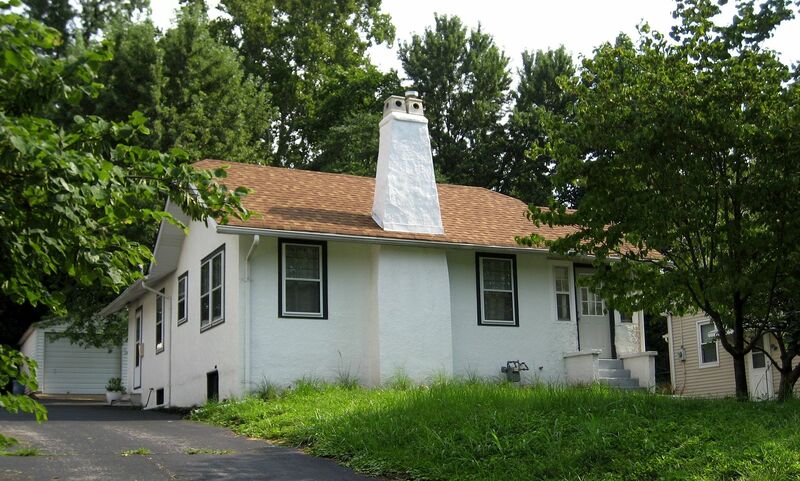 To learn more about the kit homes of West Virginia, click here. 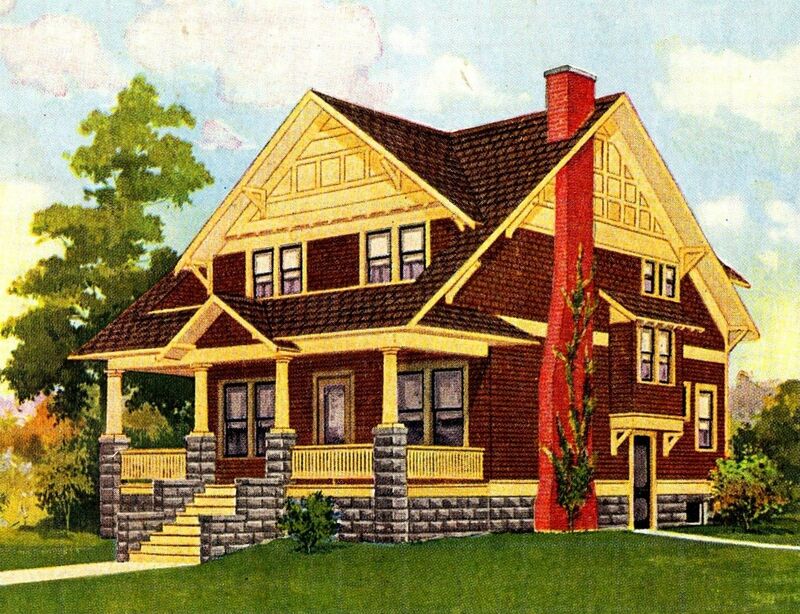 To learn how to identity Sears Homes, click here. Oh My! 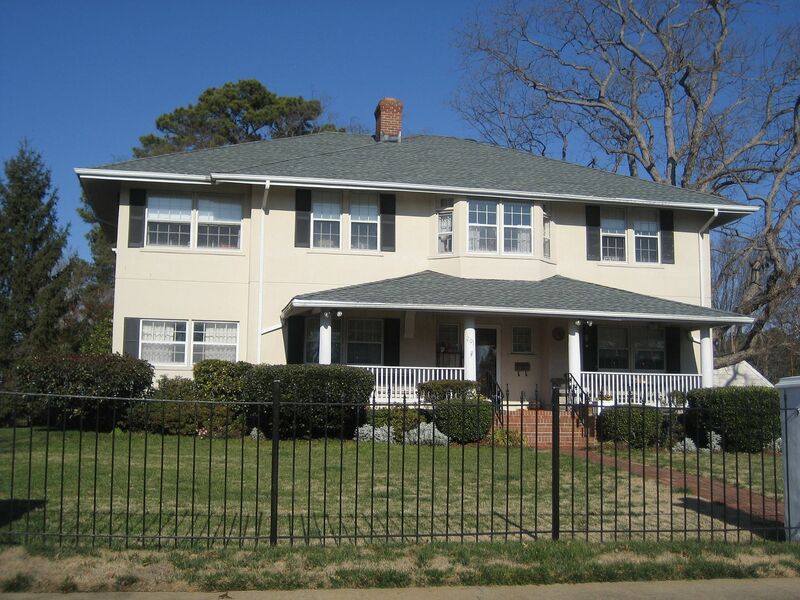 So Many Kit Homes in Hampton, Virginia! Whilst driving around Hampton, I found more than 50 kit homes in this historic river city. Not surprisingly, there are almost as many Aladdin Kit homes in Hampton as there are Sears kit homes. 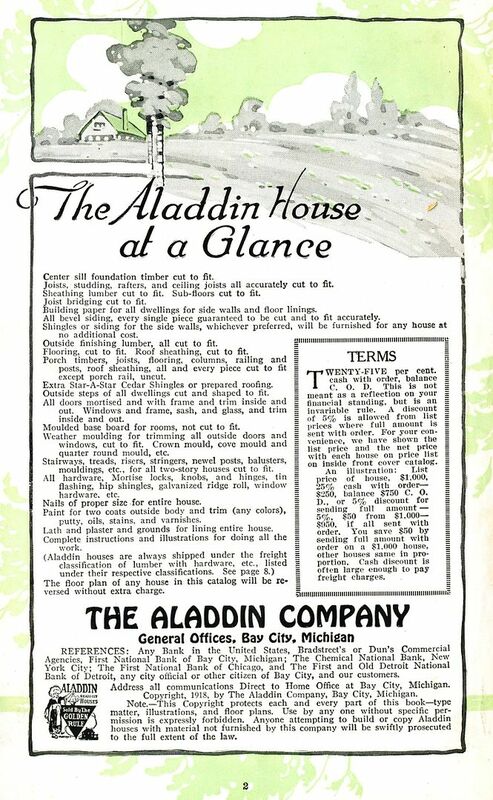 Aladdin (like Sears), sold their kit homes through a mail-order catalog. These were true kits - shipped in 12,000-piece kits - and arrived at the train station “some assembly required.” Each kit came with a 75-page instruction book that told the neophyte home builder how all those pieces and parts went together. 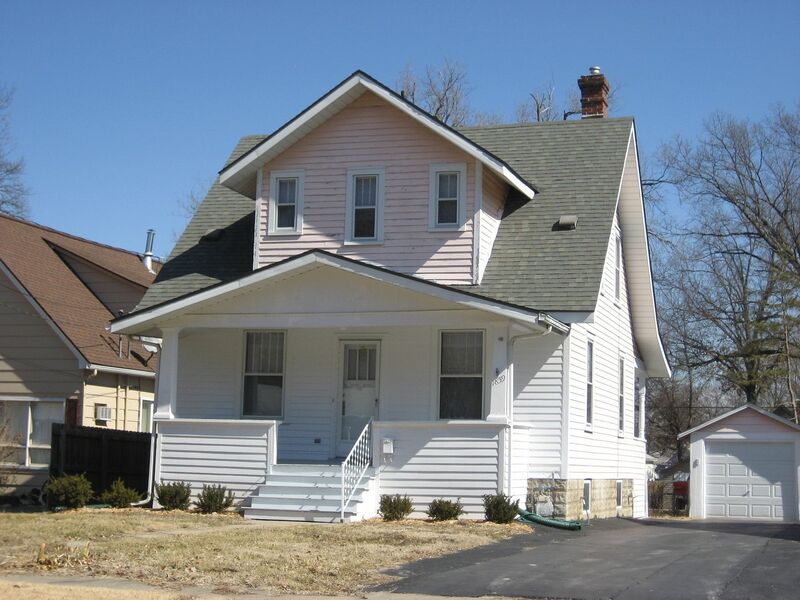 Learn more about identifying Sears kit homes here. 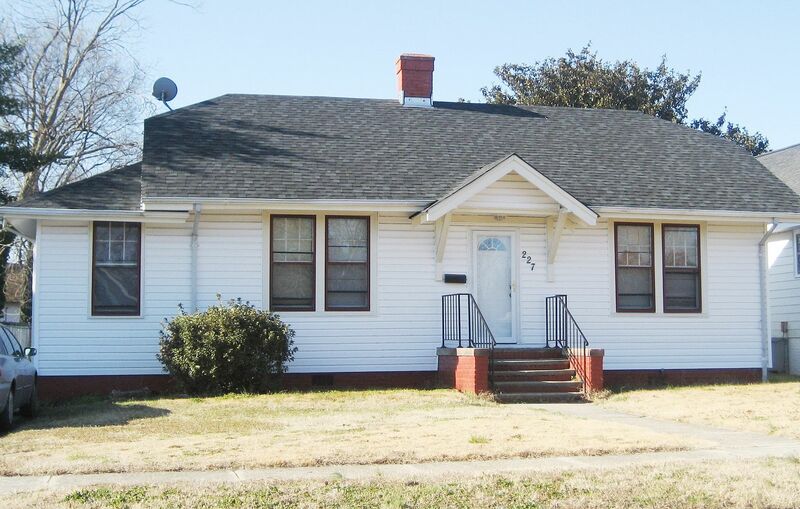 Read about the kit homes in Buckroe here! The Aladdin Brentwood was a beautiful home. And here's the picture-perfect Aladdin Brentwood in Hampton. One of my favorites, the Aladdin Shadowlawn (1919 catalog). What a beauty! A perfect Aladdin Shadowlawn! Just perfect. The Aladdin Pasadena was another very popular house for Aladdin. And there are several of these in Hampton. Here's one! The Sears Fullerton is a big, bold and beautiful foursquare (1925). 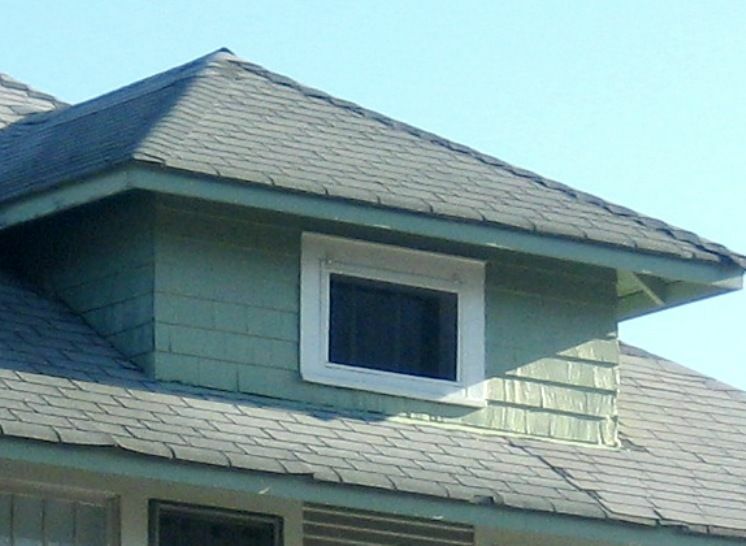 One of the characteristic features of the Fullerton is that broad dormer with one tiny window. 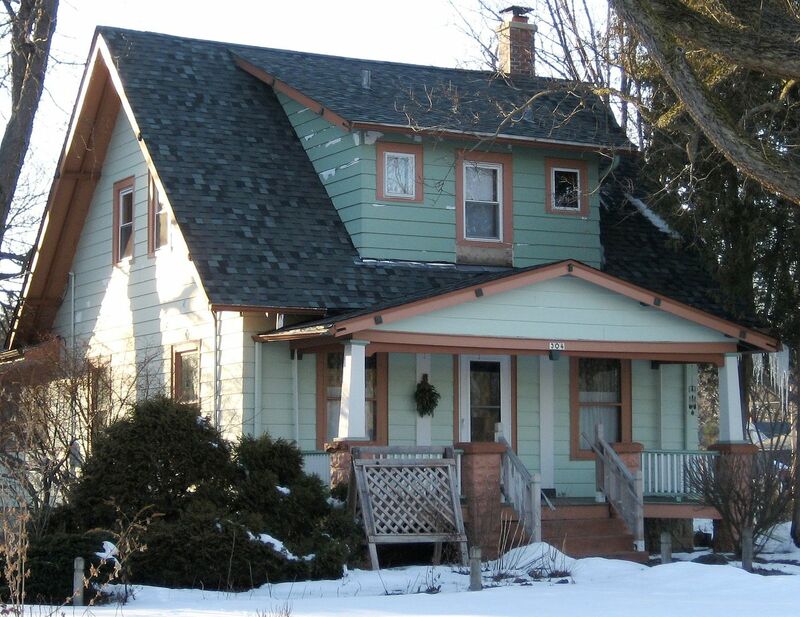 This house still retains its original siding and windows! Another fun find was the Sears Hathaway (1925 catalog). In addition to Sears and Aladdin, I also found a kit home sold by Lewis Manufacturing. The Lewis Shelborne - looking just like the catalog image above! 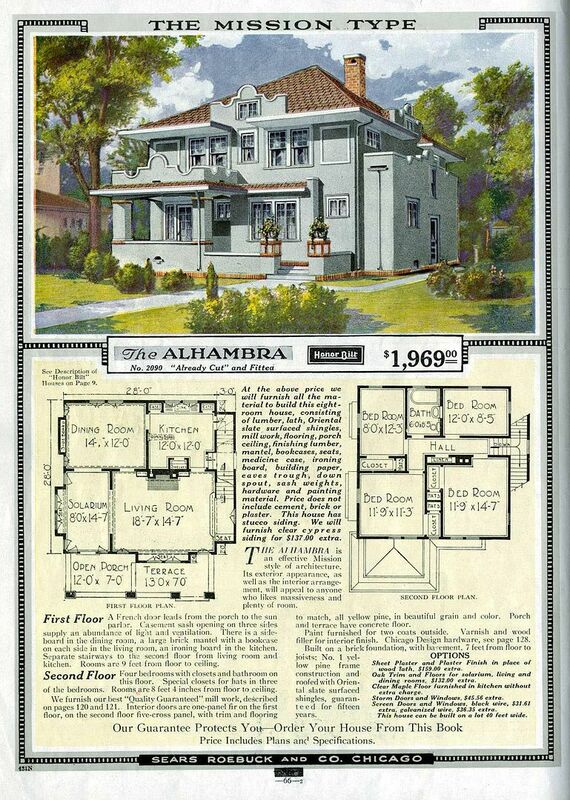 The Sears Alhambra was a perennial favorite (1919 catalog). And Hampton's Alhambra is dressed in brick! 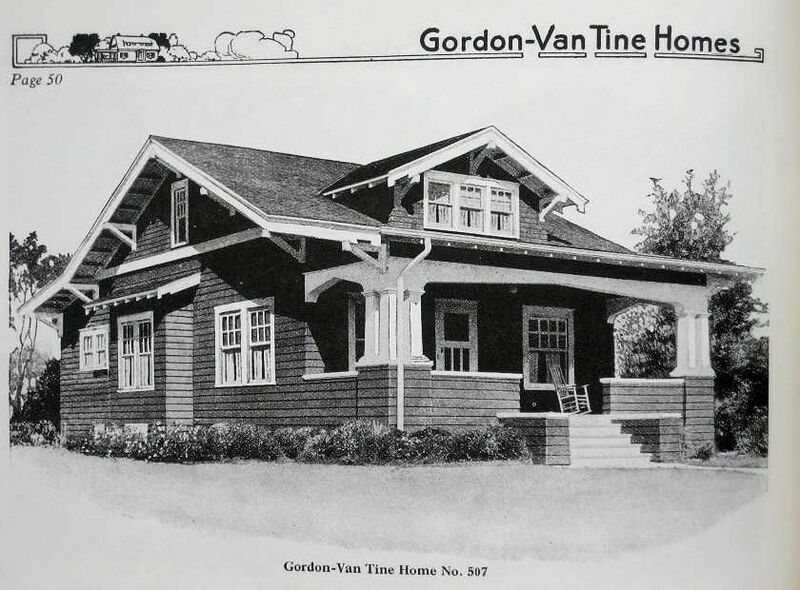 Gordon Van Tine was another kit home company that sold mail-order homes in the early 20th Century. The model shown above was known as "The Roberts" (1921). This one in Hampton faces the water - and it's been supersized! 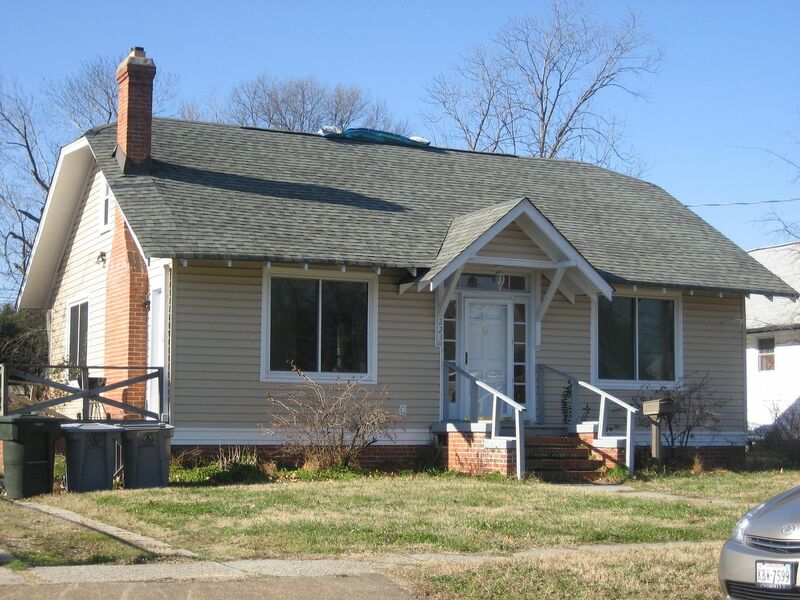 To learn about the kit homes I found in Newport News (East End), click here. 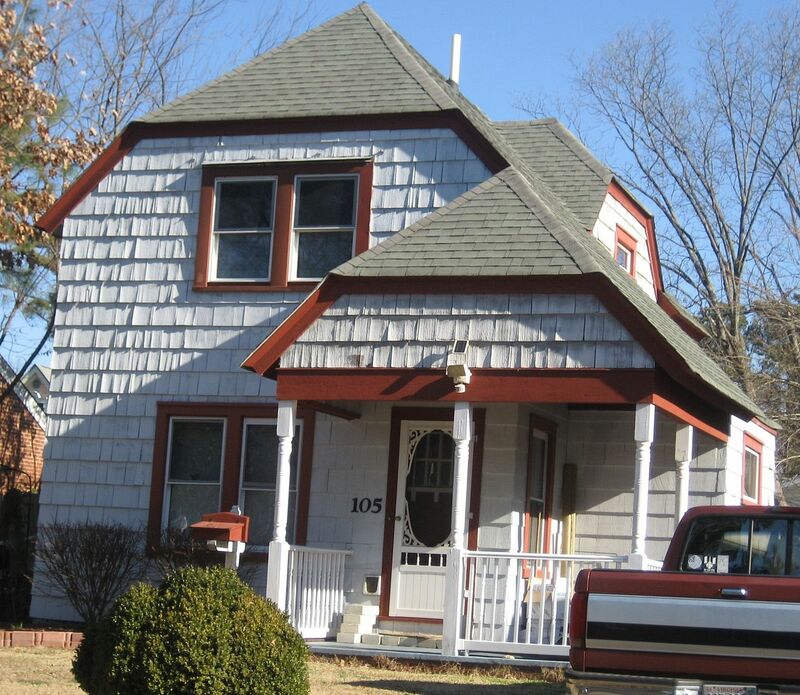 To read about the kit homes of Norfolk, click here. Aladdin Shadowlawn in Concord, NC - And Now I Know WHERE! 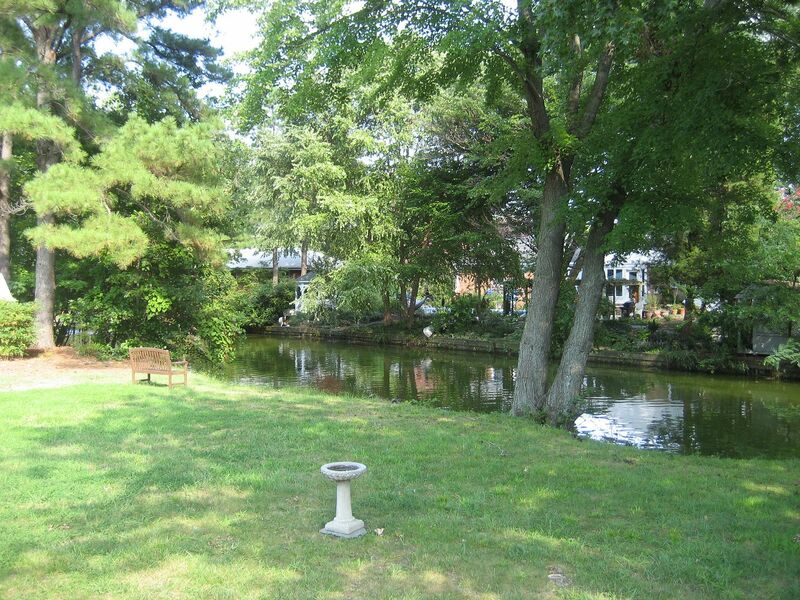 Last week, I published a blog about a beautiful Aladdin Shadowlawn I found in Concord, NC. At the time, I couldn’t find the address. My addresses are stored in notebooks, and they’re not in any particular order. Retrieving an address from a trip made long ago can be pretty challenging. However, once the hoopla of Christmas had settled a bit in the Thornton Home, I went looking for that address in Concord. And I found it! This Aladdin Shadowlawn is on Grove Street. 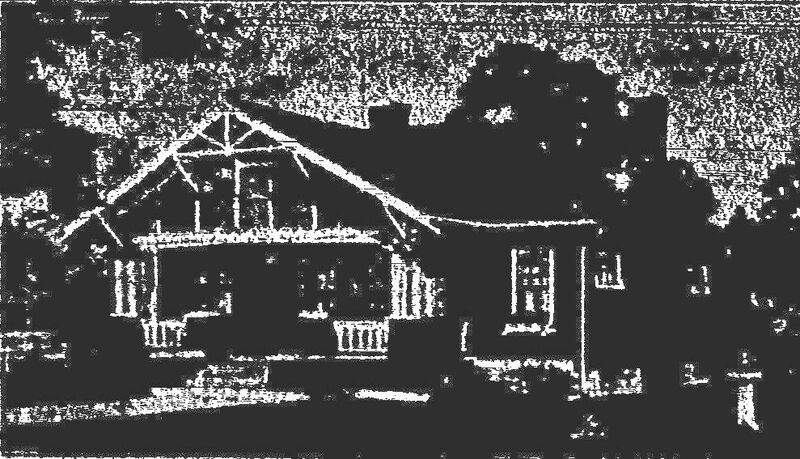 BTW, when I was in Concord, I was on my way to another North Carolina city, so I didn’t do a “proper” and extensive survey of Concord, but I do remember finding some other Aladdin kit homes there, including, an Aladdin Pomona, and an Aladdin Sheffield, and this Aladdin Shadowlawn (see below). It’s not surprising that this part of North Carolina is so loaded with kit homes, because Aladdin had a major mill in Wilmington, NC. In fact, Roanoke Rapids has one of the largest collections (and most impressive collections) of Aladdins in the country! It’s worth the trip, I promise! 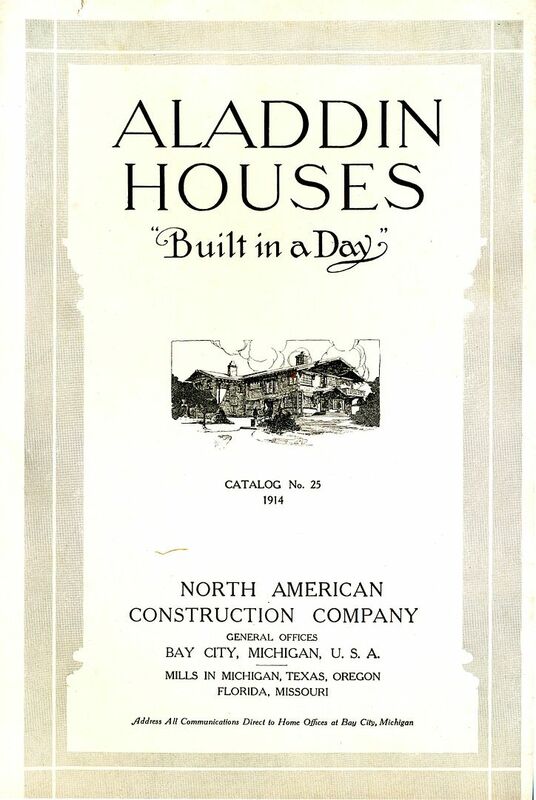 Aladdin was one of six national mail-order companies that sold entire kit homes through their catalogs. The houses typically arrived by train in 12,000 pieces and came with a 75-page instruction book that told the homeowner how all those pieces and parts went together. Today, there are about 75,000 Aladdin kit homes in the country (compared with about 70,000 Sears Homes in the country). 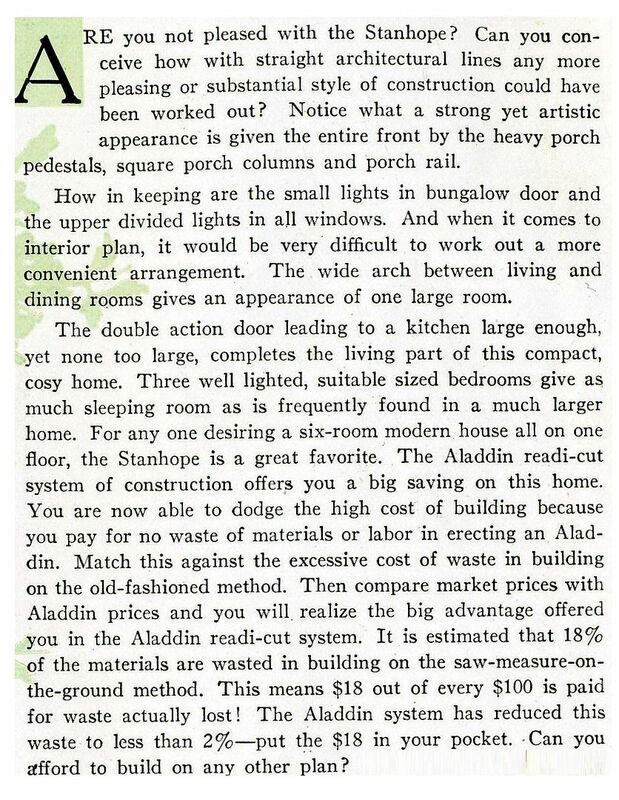 While Sears is a more well-known name in the kit home business, Aladdin actually was around a lot longer. Sears started in 1908; Aladdin started in 1906! 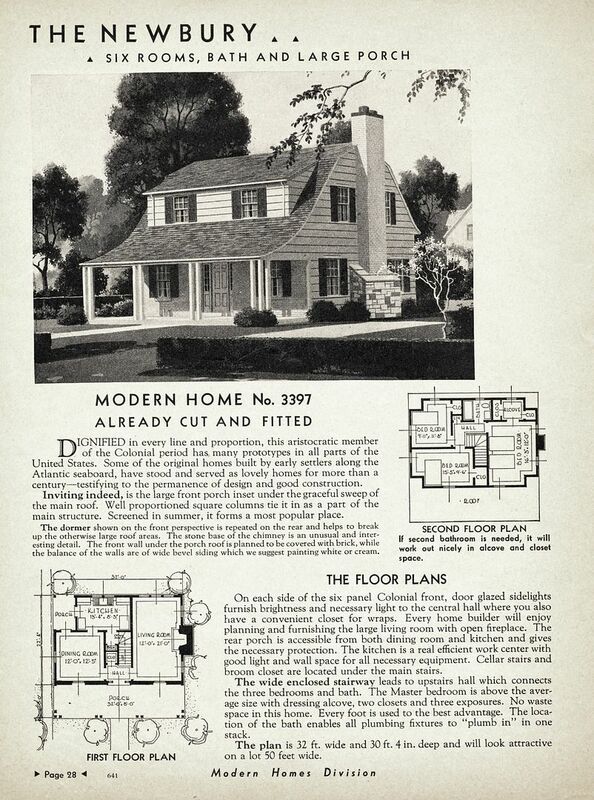 In 1940, Sears called it quits, and closed their Modern Homes department. Aladdin continued to sell kit homes until 1981. 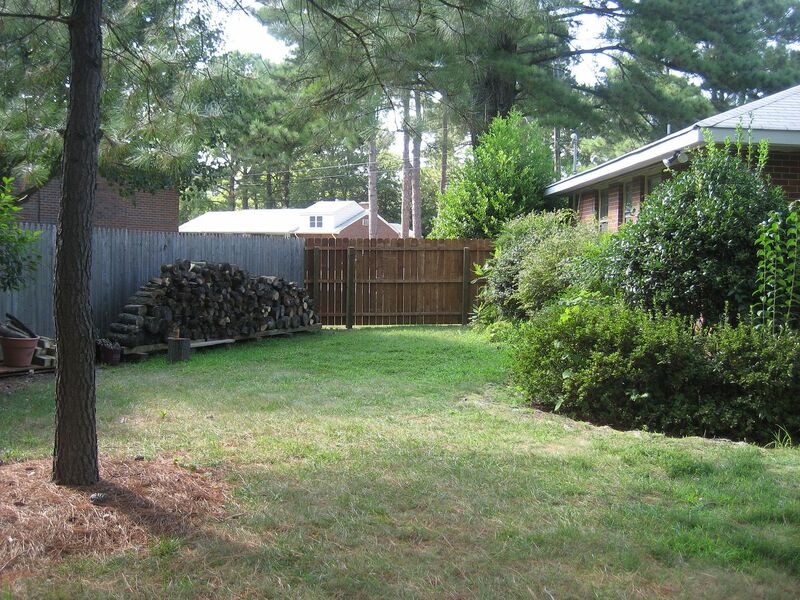 To learn about the Aladdin Homes in Rocky Mount, click here. 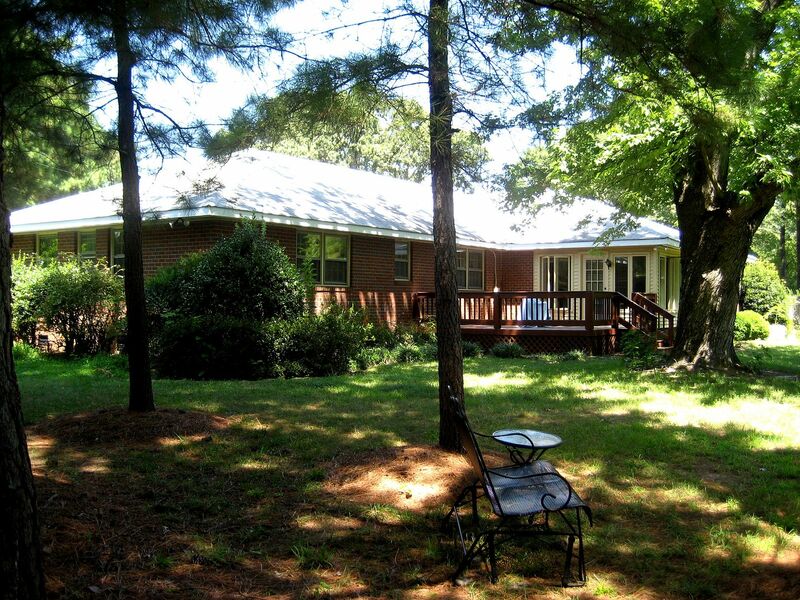 To learn more about the massive collection of Aladdin kit homes in Roanoke Rapids, click here. 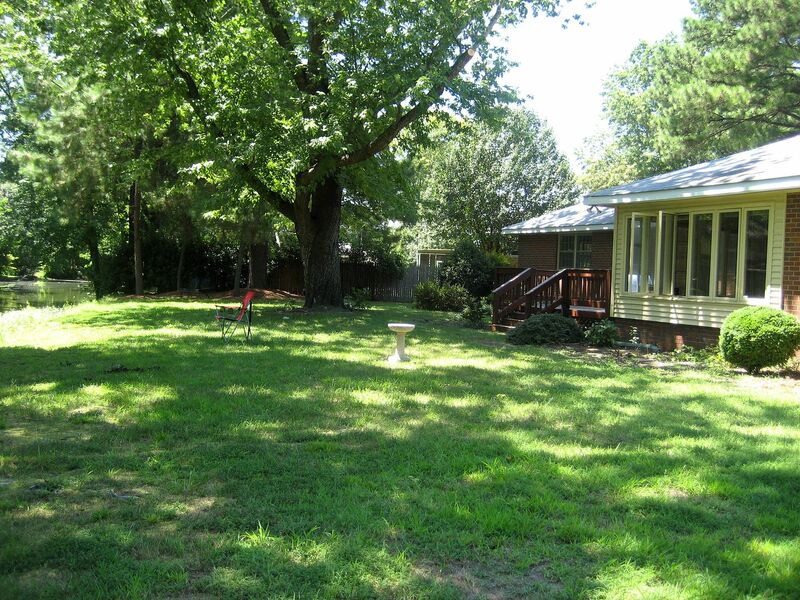 The Aladdin Shadowlawn was a big, beautiful kit home, and there's a perfect Shadowlawn in Concord, NC. 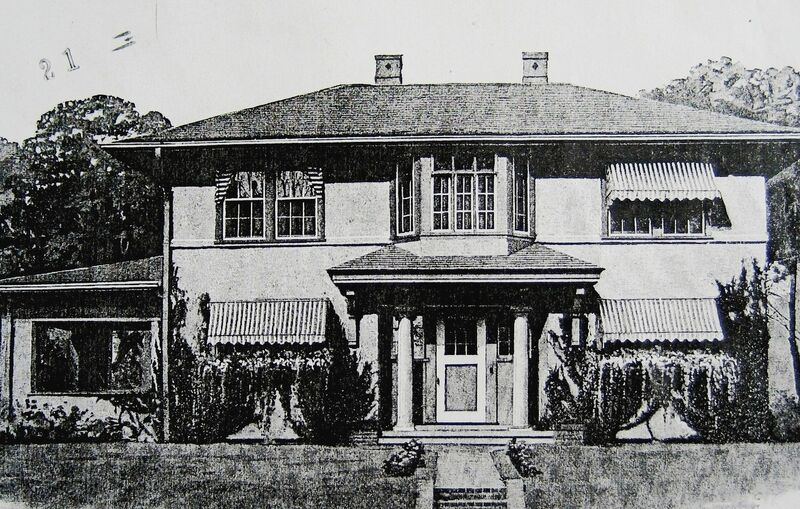 Image is from the 1919 catalog. And here it is, a perfect Shadowlawn in Concord, but what is the address? Somewhere in Concord, I think I saw a Plaza, too. In Roanoke Rapids, NC, you'll find this *perfect* Aladdin Pomona and the best part - it really is ON the railroad tracks! 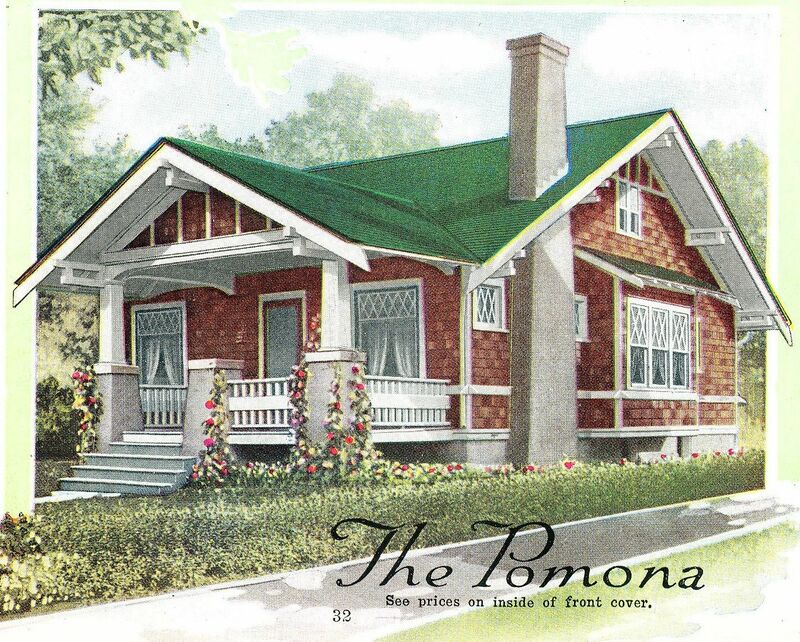 As I recall, there is a Pomona in Concord. Aladdin offered some pretty fancy houses, too, such as this Aladdin Villa. 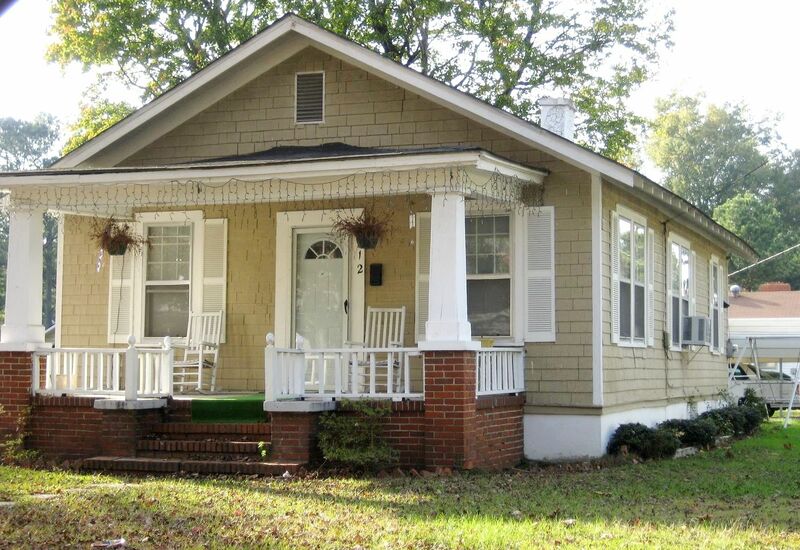 If you love kit homes, you have to visit Roanoke Rapids. 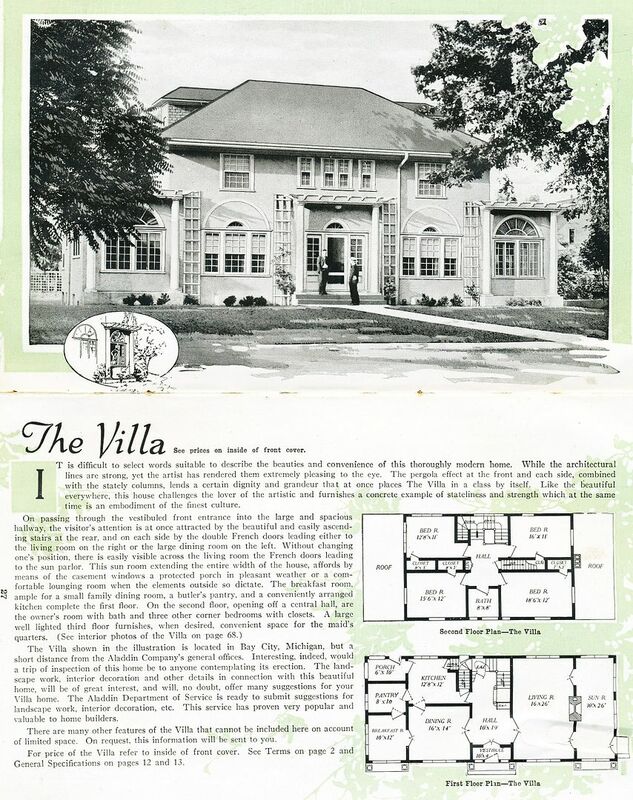 It was a town built by Aladdin, and it was a wide variety of Aladdin kit homes, including this Aladdin Villa (Aladdin's biggest kit home). 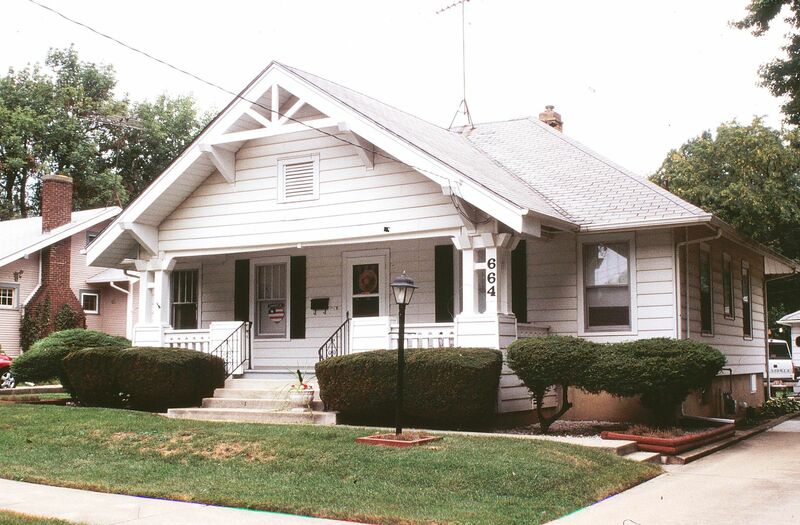 Aladdin was a kit home company based in Bay City that sold more than 75,000 kit homes during their 75 years in the kit home business. Aladdin also sold entire cities of their kit homes, and one sterling example is Roanoke Rapids, NC. In that small town, we've found more than 60 Aladdin Kit Homes, including some of Aladdin's biggest and fanciest homes. Aladdin Homes were made with quality materials - first growth lumber out of virgin forests - the likes of which we will never again see in this country. 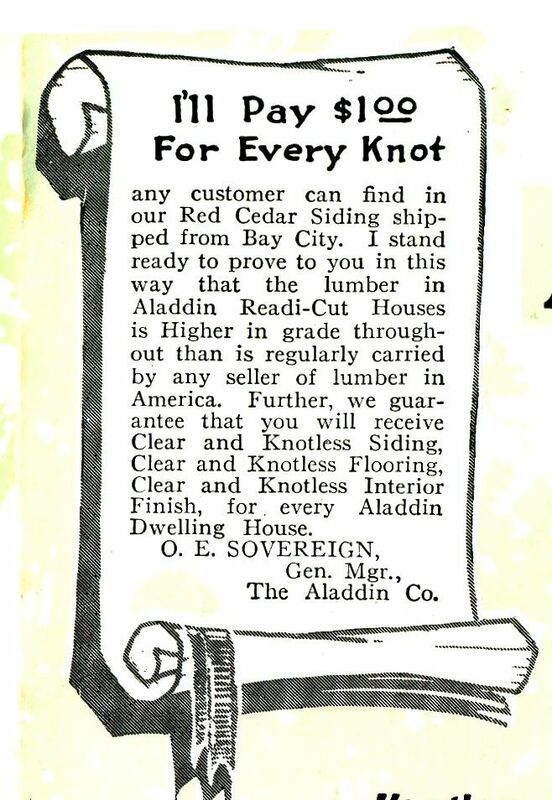 My favorite graphic from the 1914 Aladdin catalog. 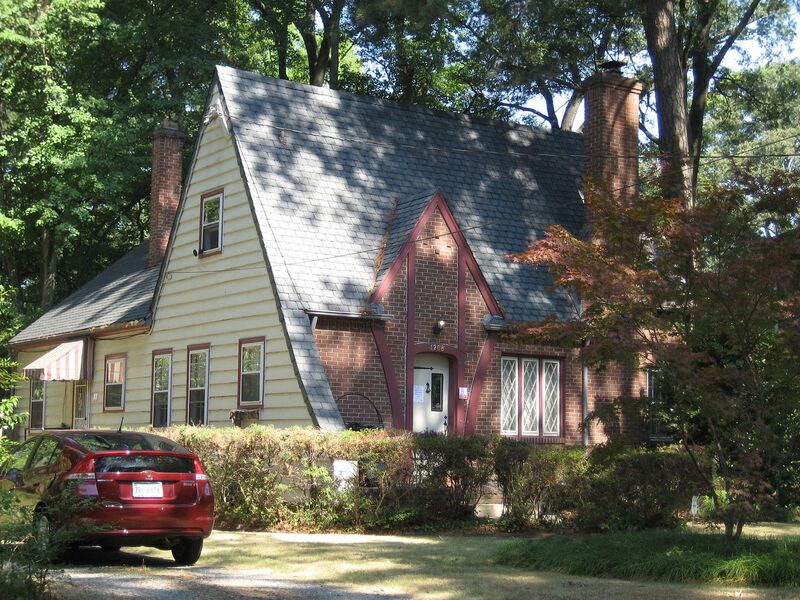 Today, we celebrate 10 days at our new house, a 1962-built brick ranch in Norfolk’s Bromley neighborhood. Every day, I find something new about this house that affirms it is indeed, The Perfect House for us. And it also has The Perfect Backyard. Yesterday, I saw an Snowy White Egret perched atop a branch in the canal, just waiting for his breakfast to swim by. And yesterday, our new fence went in, so that Teddy the Dog could have her freedom restored. Heretofore, she’s been crying like a baby, due to being tethered on a tie-out in the back yard. It was a pitiable sight, and now we have a fenced yard again. 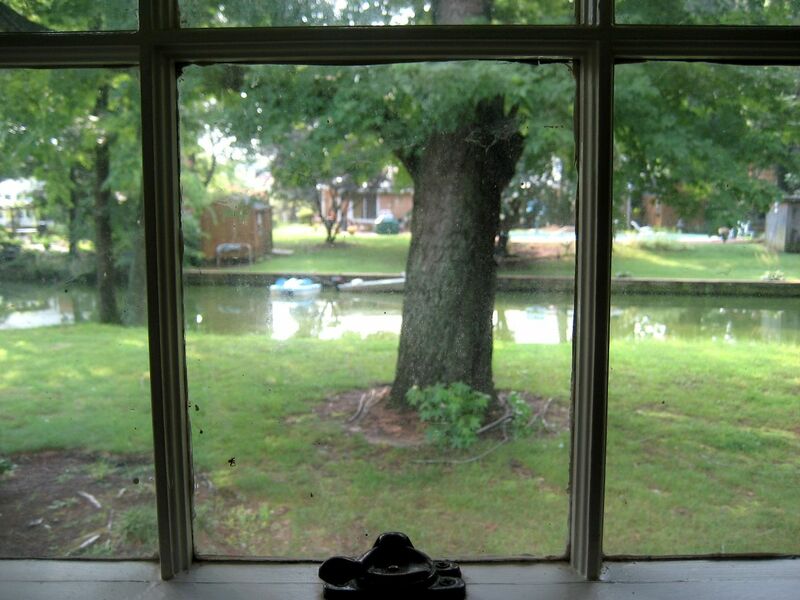 Despite our ten days here at the new house, it still makes my heart leap when I look out the back windows and see that beautiful canal out there. I’ve spent 52 years dreaming of life on a lake, and here I am, living the dream. It sure is lovely. Here are some photos of our perfect backyard at The Ringer Ranch. We spend a lot of time sitting in that bench! Today, our new fence was installed, enabling Teddy the Dog to be free again. And it's a beautiful house, too! Better view of our canal. 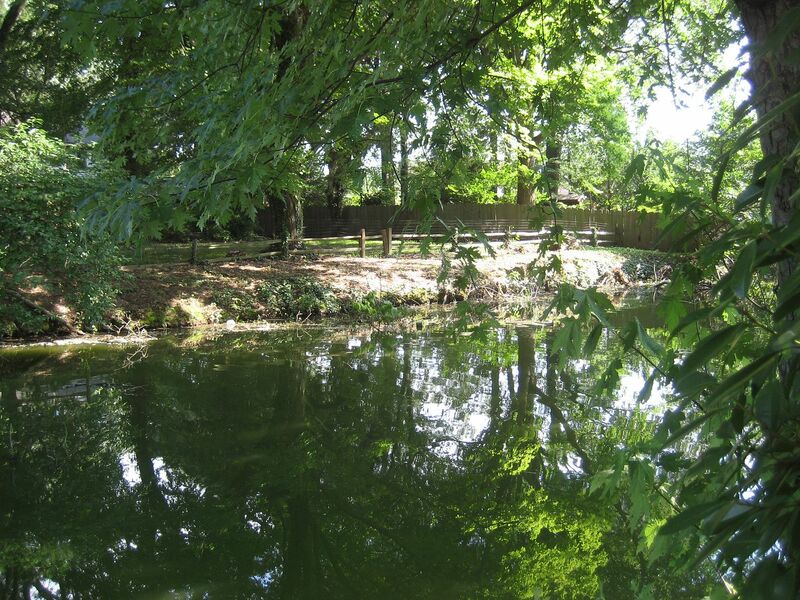 The other photos (above) show the canal leading up to Lake Whitehurst. This is a view of the canal leading down stream. To buy Rose’s books, click here. 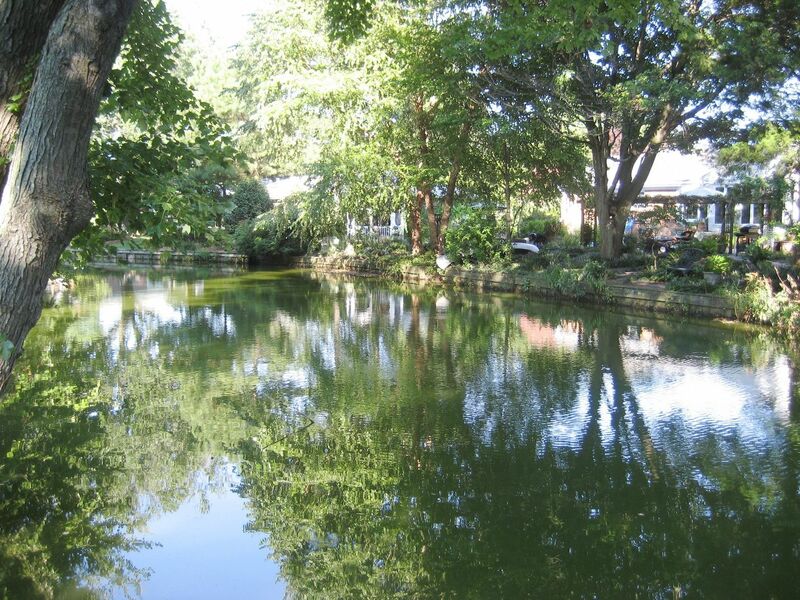 Before my father’s death on June 10, 2011, I’d never heard of Lake Mills. Heck, before my father’s death, I never knew I had an Aunt Addie (who lived and died in Lake Mills)! And I most certainly never knew that she’d been shot (allegedly) by her famous, wealthy, older husband Enoch. 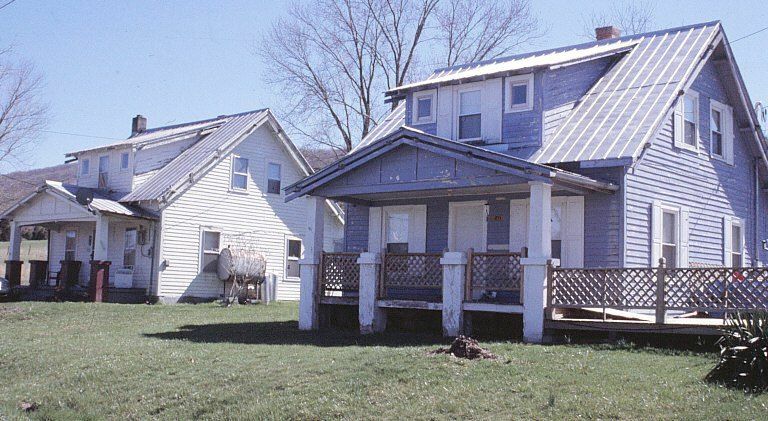 And indeedy do, I’ve already learned of three kit homes there in Lake Mills. The first is from Sears, the second is from Gordon Van Tine and the third is from Montgomery Ward. In fact, Gordon Van Tine was the supplier of Wardway Homes (which explains why Montgomery Ward and GVT catalogs were identical). 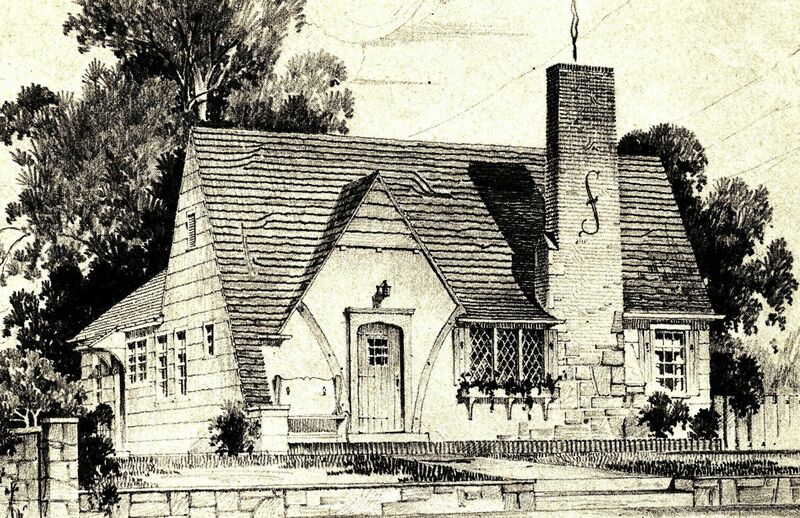 Mail-order kit homes were just that - kits ordered from a mail-order catalog. 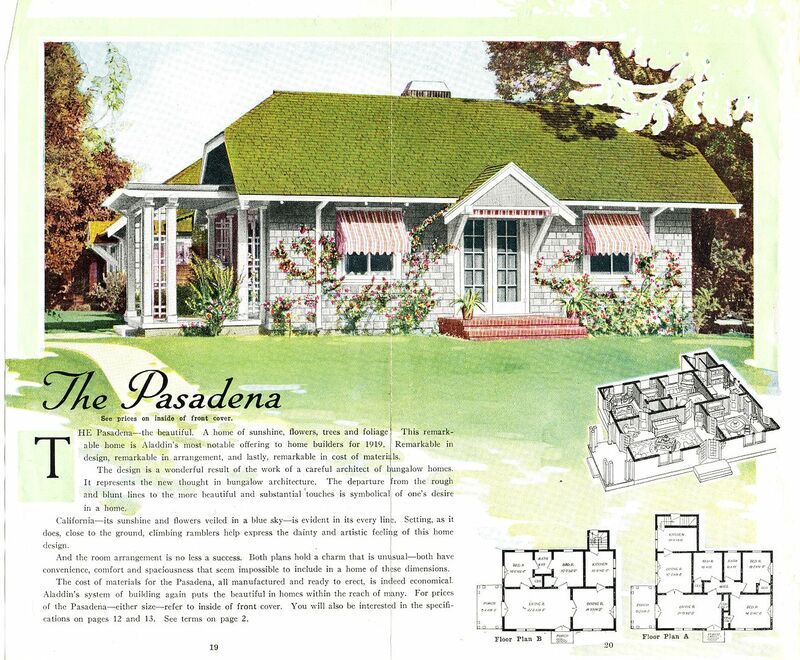 These houses arrived as 12,000-piece kits (yes, 12,000 pieces) and came with a 75-page instruction book that told the wanna-be homeowner how all those pieces and parts went together. 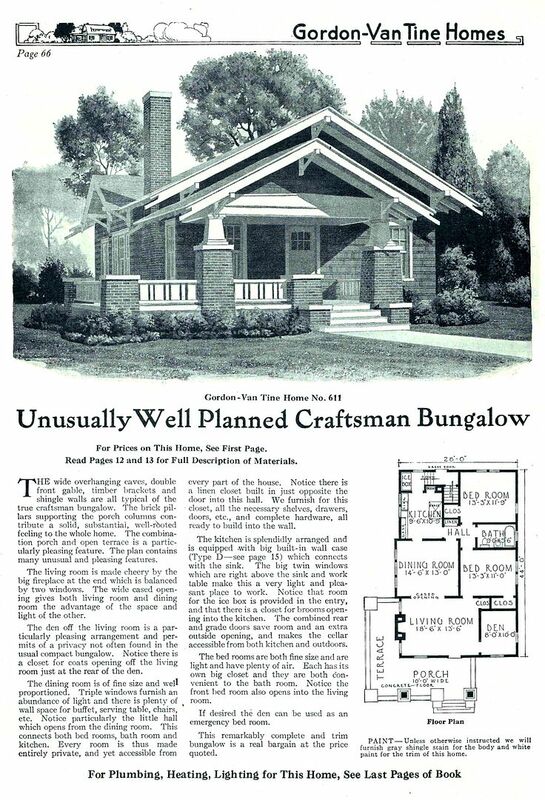 Sears (one of six kit home companies doing business on a national level) promised that a “man of average abilities” could have the house assembled and ready for occupancy in 90 days! 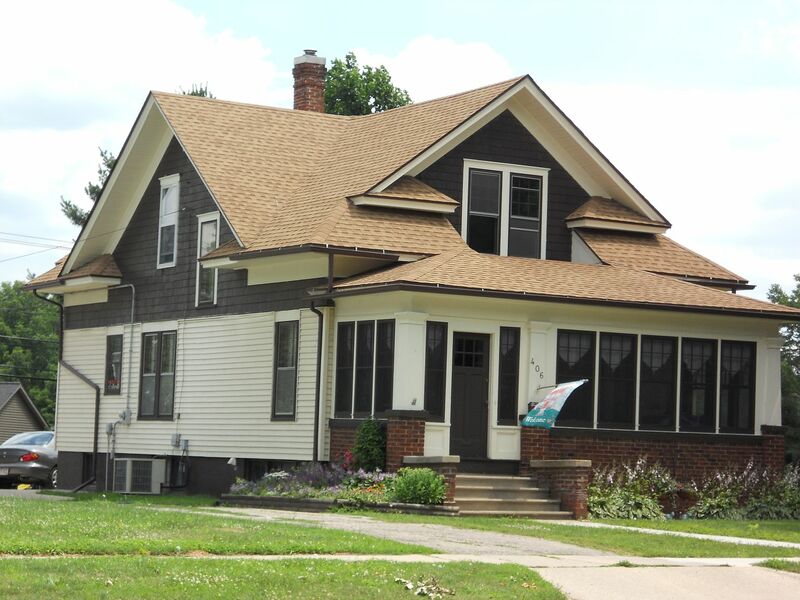 Each kit included everything you would need to finish your dream home, including 750 pounds of nails, 27 gallons of paint and varnish, 10 pounds of wood putty, 72 coat hooks, roofing shingles, door knobs, lumber, windows, flooring…well you get the idea. It really was a complete kit. 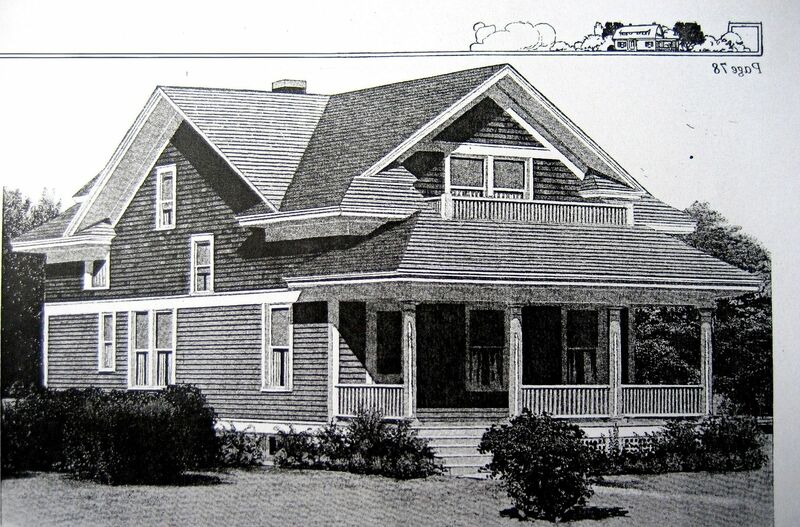 The houses were delivered by train and most kit homes could fit in one well-packed boxcar. 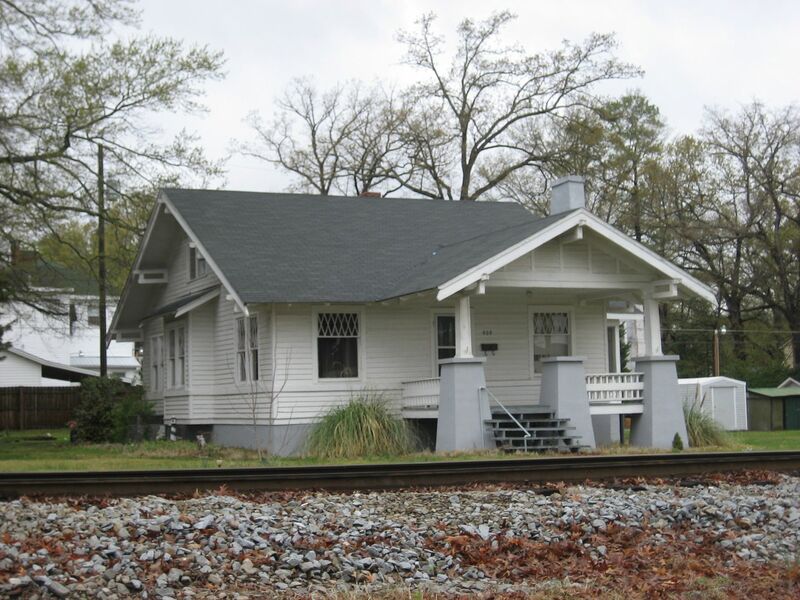 Today, these early 20th Century catalog homes are typically found within 1-2 miles of railroad tracks, just because the logistics of hauling all those pieces of house was so problematic! And one last fact - about 90% of the people living in these homes had no idea about the unique origins of their home until I knocked on their door (or blogged on my website) and told them! My raison d’être is to help folks learn more about this historically significant (and nearly forgotten) piece of America’s architectural heritage. And thanks to Dawn Stewart and Sandy Spann of Lake Mills, Wisconsin, for supplying these photographs of the three kit homes in Lake Mills, Wisconsin! And thanks to Rebecca Hunter for telling me about the Newbury! Enjoy the photos below! And leave a comment! 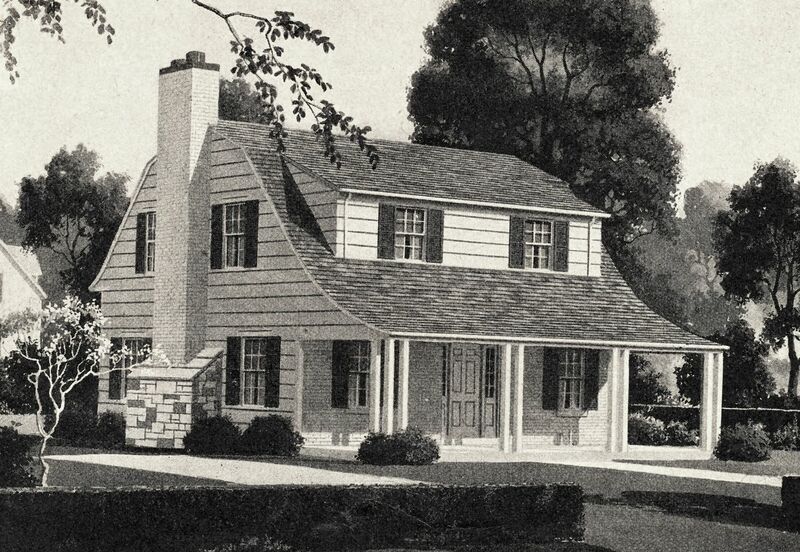 Sears Newbury, as it appeared in the 1936 Sears Modern Homes catalog. 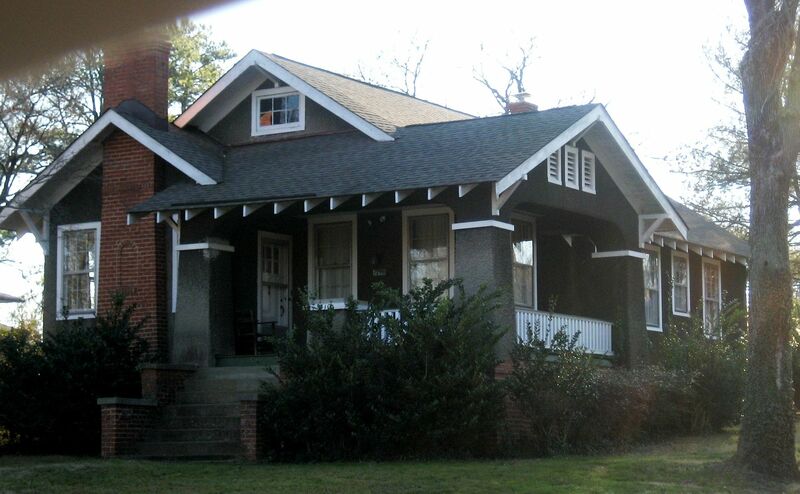 Notice the swoop in the roof as it extends over the wide front porch. 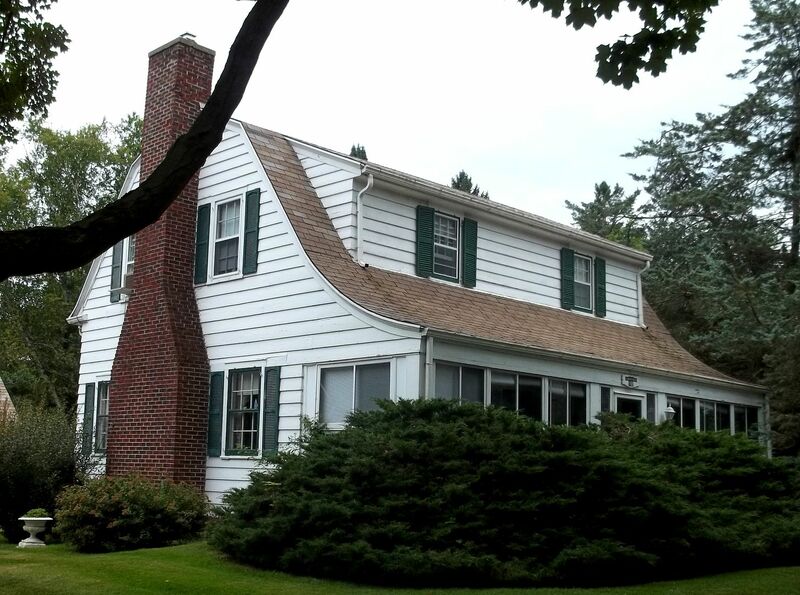 On the rear, there's a small cornice return, and it's on a different plane that the front roof. 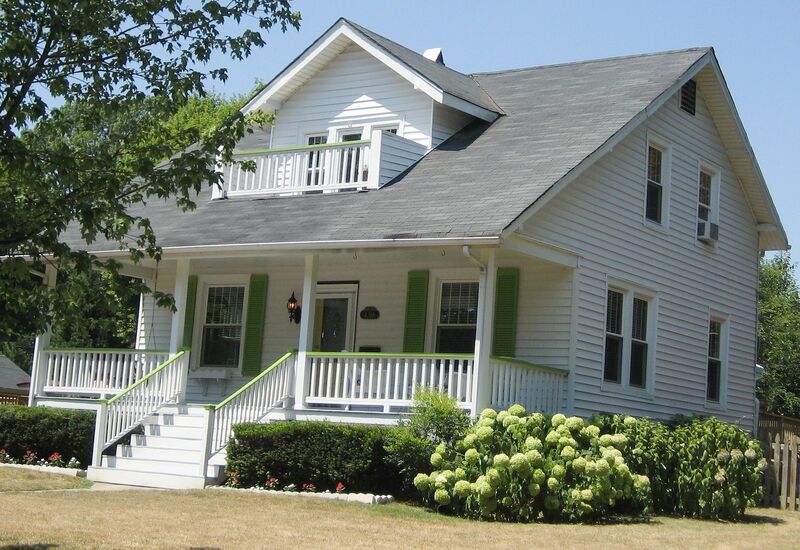 To read more about this Newbury in Lake Mills, click here! 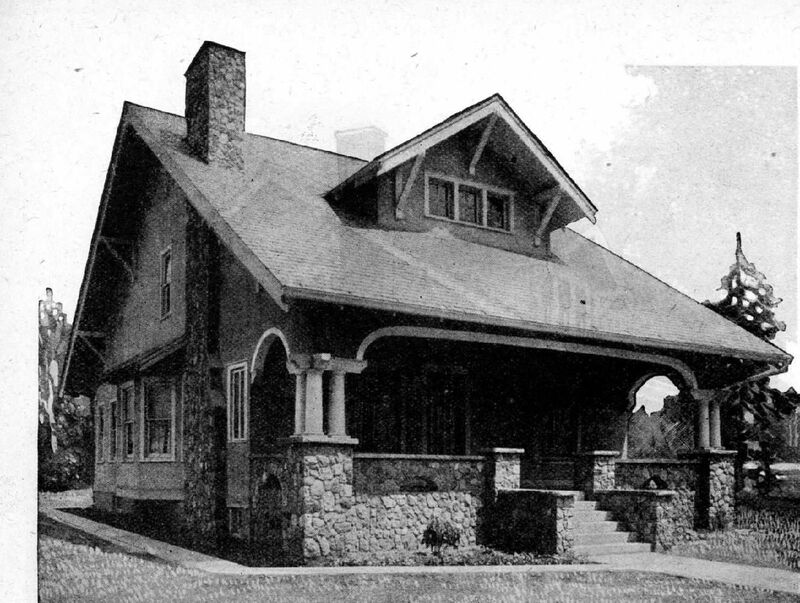 As seen in the 1921 catalog, this is a very unusual house, and the house in Lake Mills is a beautiful match with only one difference - that original railing across the dormer is missing. 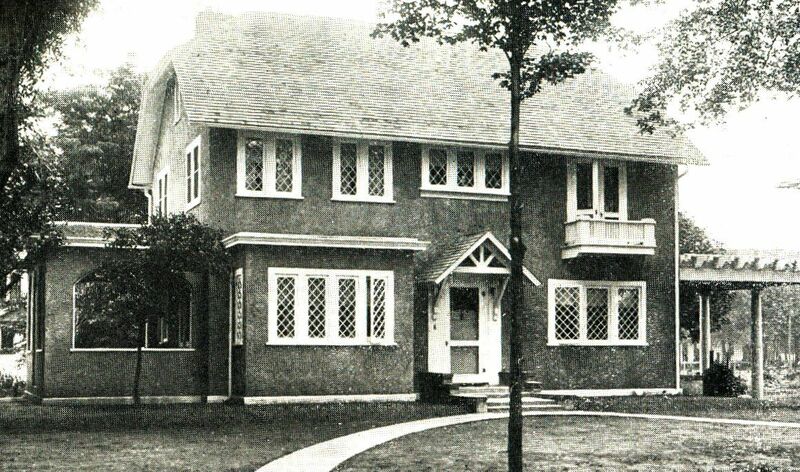 And here's a photo of Gordon Van Tine Home #705 in Lake Mills, Wisconsin. 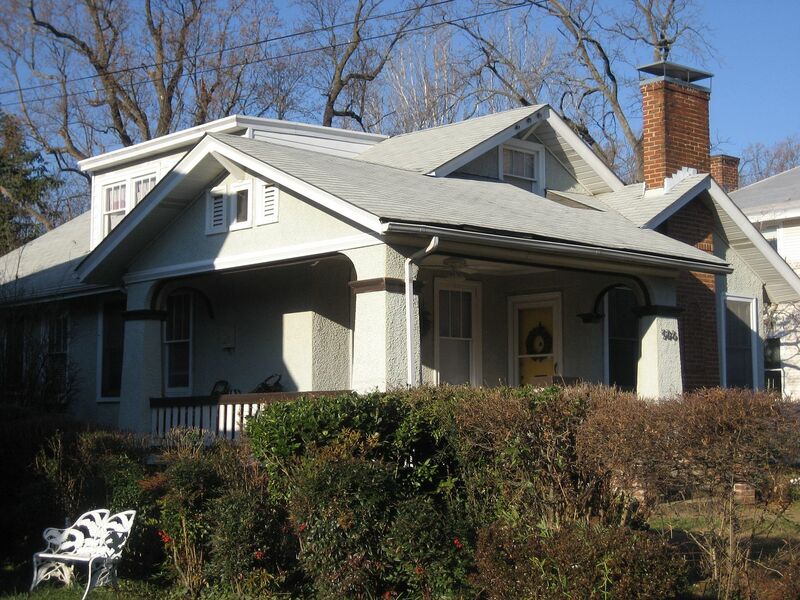 It's a beautiful house in wonderful condition and a spot-on match to the original catalog picture! 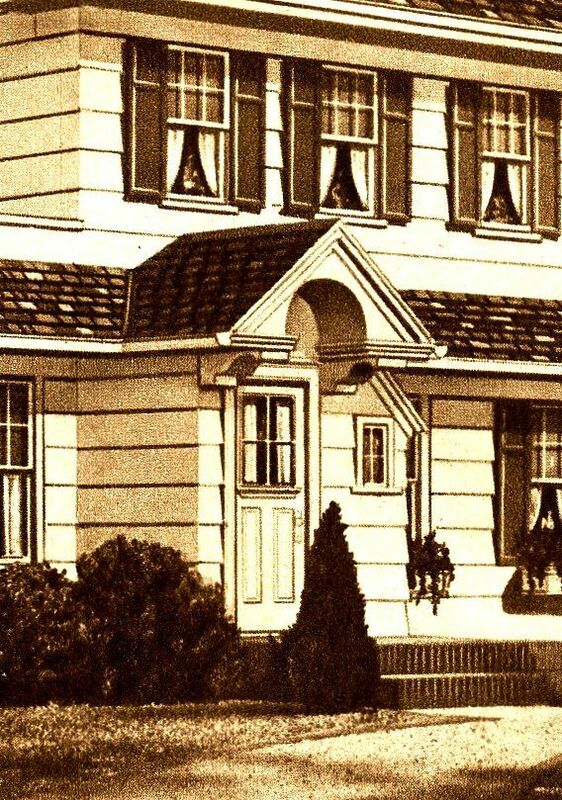 Look at the windows on the side, and how they're just the same in both the Lake Mills house and the vintage catalog picture. My oh my, that does indeed warm the cockles of my heart. Photograph is courtesy Dawn Stewart (copyright 2011) and may not be used or reproduced with written permission. 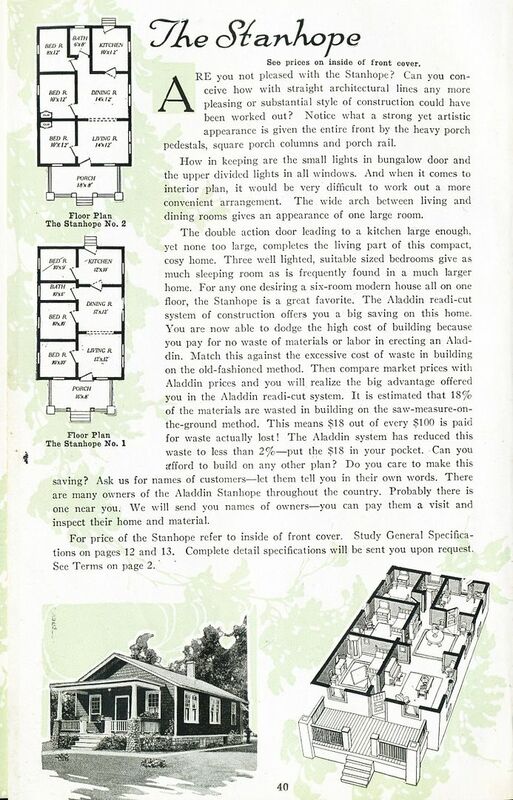 These mail-order kit homes (such as the GVT 705) could be ordered "reversed," and what's shown above is the mirrored image of the catalog page (note page number on upper right). This really is a beautiful match to the house above! 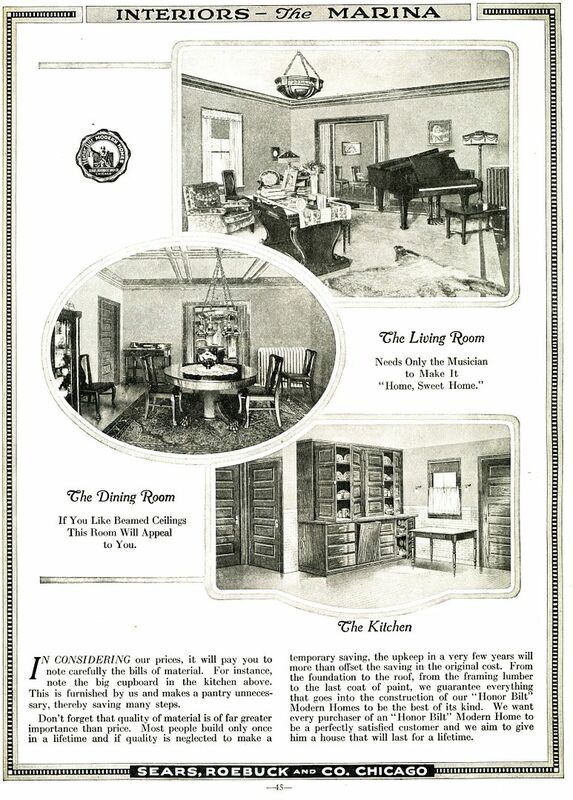 These catalog images are from the 1921 Gordon Van Tine catalog. Just in case you wanted to see them side by side. The next one is Montgomery Ward #123 (shown below). 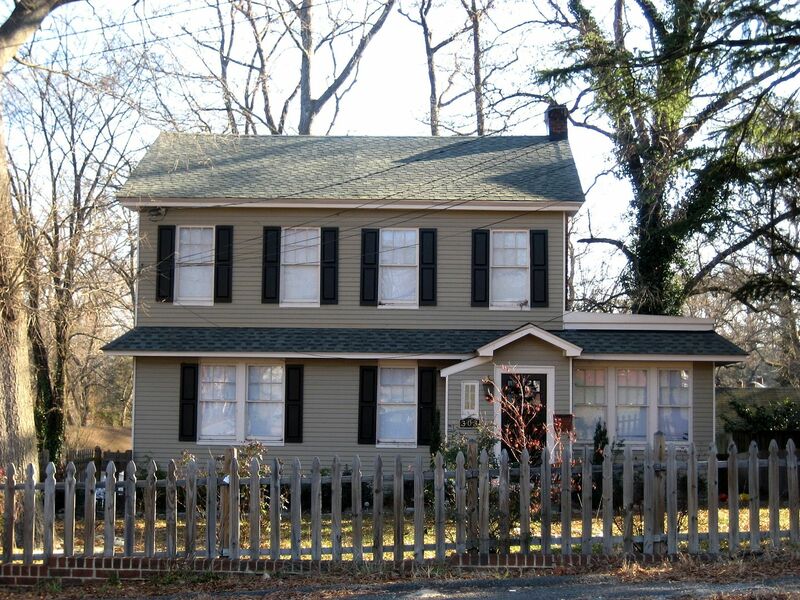 This house is really distinctive, mainly because of that second floor bay window! 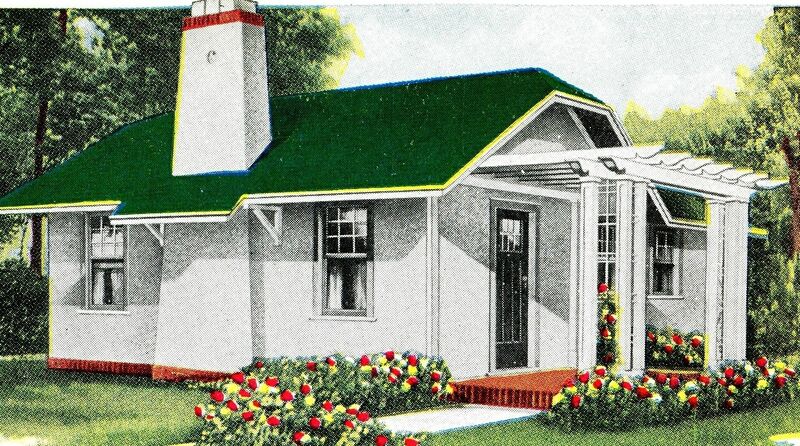 Montgomery Ward sold about 25,000 kit homes during their 20+ years in the kit home business. Not surprisingly, the majority of these homes are probably within a 300-mile radius of Chicago (where Montgomery Ward was located). Look at the window! 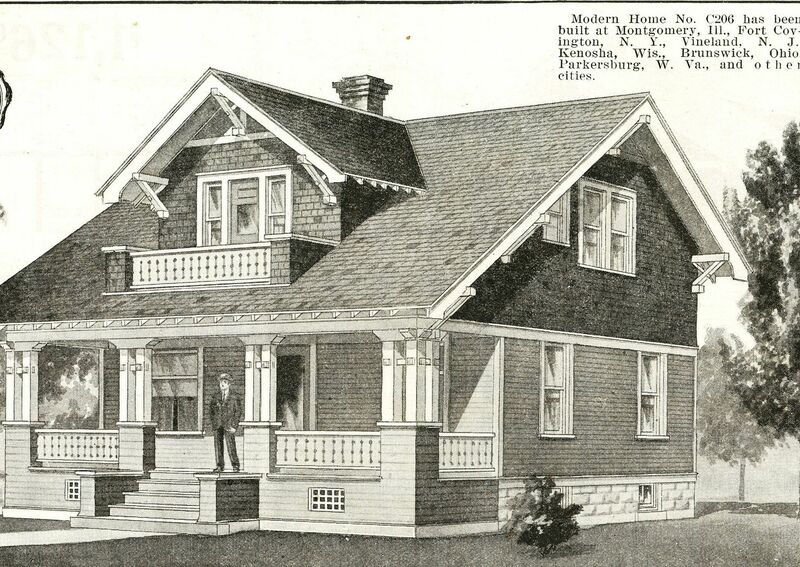 The house in Lake Mills (on Water Street) is a very good match to this catalog image (1914). 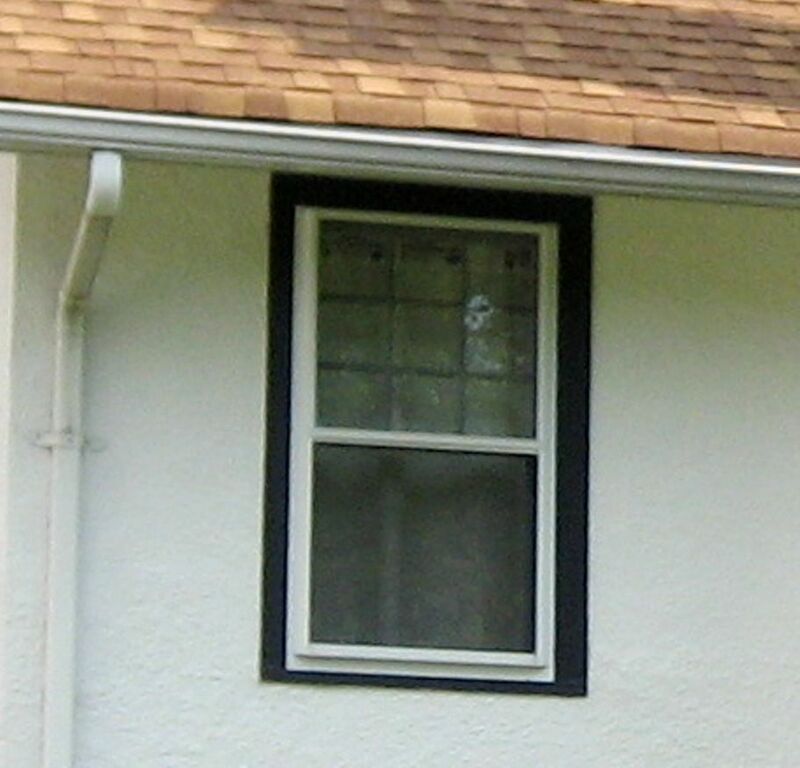 Note the placement of the window directly beside the front door. 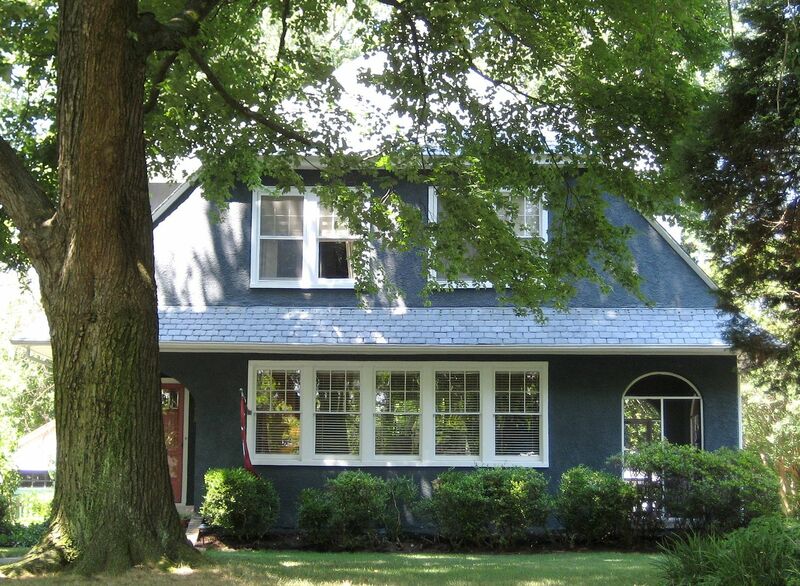 And also note those supersized cornice returns on either side of that second-floor bay window. 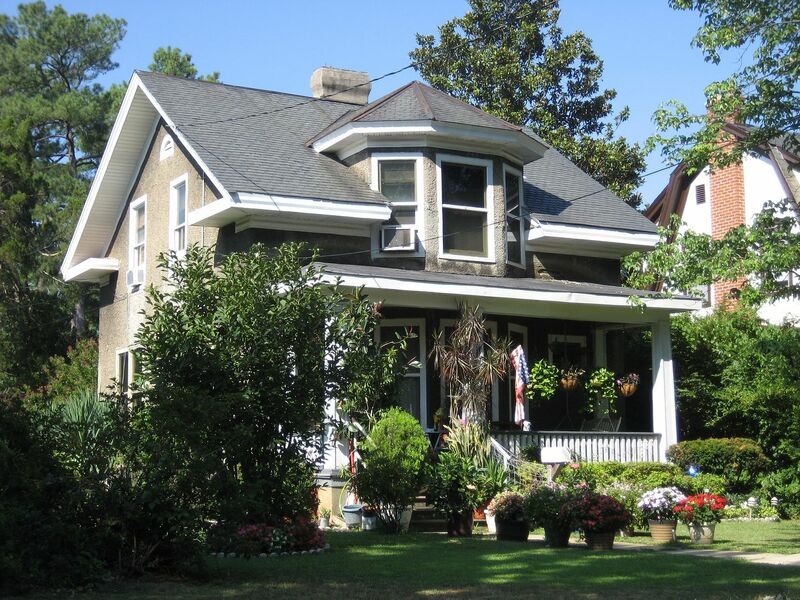 The front porch has a hip roof, with three round columns. All these features are also in evidence on the house in Lake Mills (see next photo). Easy as 1-2-3 to identify! This is Montgomery Ward Home #123, in Lake Mills, WI. Photograph is courtesy Dawn Stewart (copyright 2011) and may not be used or reproduced with written permission. Now this next one…I’m not so sure about. Read the caption below for more info. Do you think you have a kit home in Lake Mills (or nearby)? Leave a comment below! This one, I'm not so sure about. I found it whilst driving via Google Maps and made a note of it, but when I went back to get a better look, I couldn't find it! To learn about Addie Hoyt, click here.